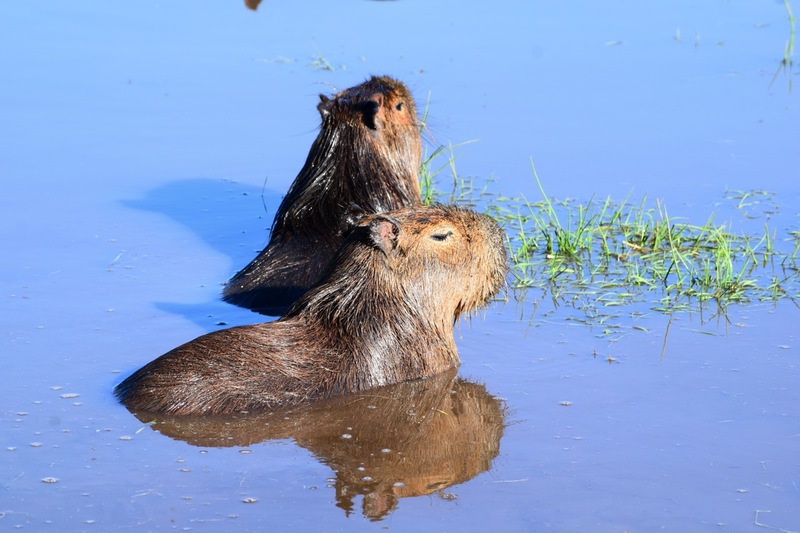 Down by the riverside: Capybaras bathing in a stream, Parque Nacional El Palmar, Entre Rios, Argentina. As we traversed Argentina for the fifth time in just over a year, it felt like a lot of the things we were seeing and doing were something of a preparation for the next phase – Brazil. Which is where we are now, although we still can’t quite believe we finally made it here. 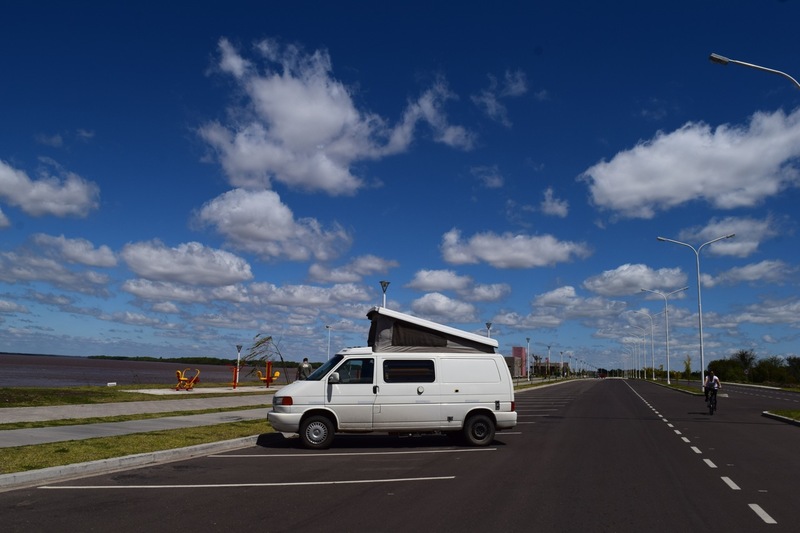 As we headed back towards the Entre Ríos (‘between rivers’) province near the Argentina/Uruguay/Brazil border, things became just that little bit more tropical – lush landscapes, more exotic wildlife, plenty of rain, increased warmth and humidity, and a sudden rise in the size and volume of the insects that wanted to come and live in the van. 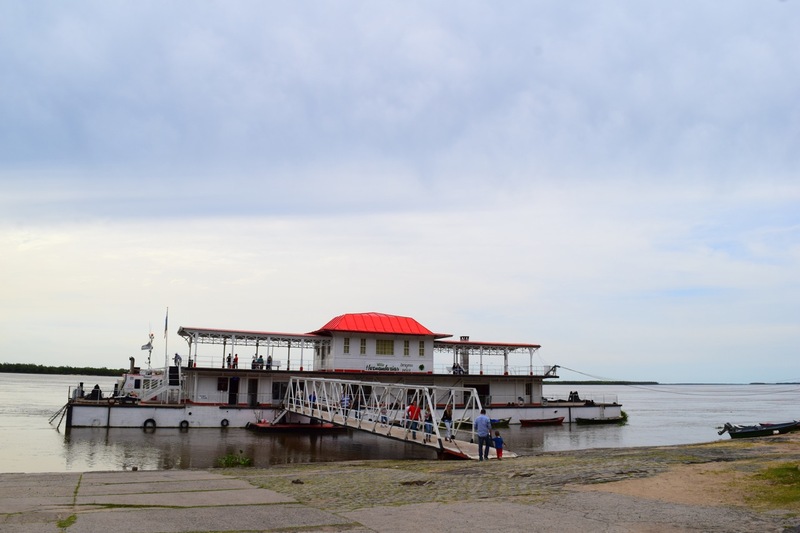 The rivers flanking the province – the Rio Paraná and Rio Uruguay – both flowed into Brazil and we were increasingly content to be carried along with them. But before our time down by the riverside, we had one last date with Argentina’s mountains. When we last wrote, we were on our way to Chilecito, in the hills of La Rioja. La Rioja?… ah, there they go chasing wine again, I hear you say. But no, we were there for its dramatic highland setting and its fascinating abandoned cableway system, which once trundled gold, silver and copper between the mine – up in the sierras at an altitude of more than 4,600m – and the town. An amazing early 20th century feat of engineering, the cableway spanned 40km and had nine stations. We visited a cute little museum at ‘station 1’ before driving up to ‘station 2’ for some fabulous views and a wander among the cablecar graveyard. 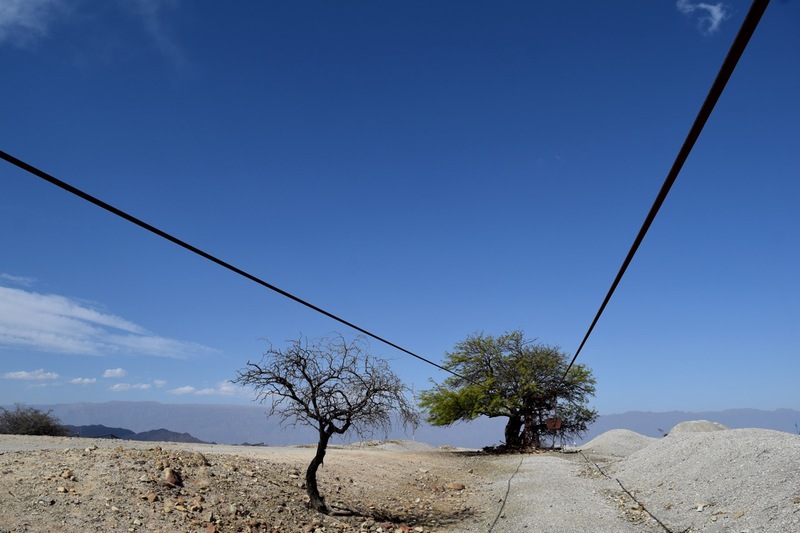 Estacion 2 of the old cableway, Chilecito, La Rioja, Argentina. We headed down to the sierras around Córdoba, stopping off in Villa de Soto to meet up with fellow road-trippers Betti and John, from the UK. We’d never met before but Betti had responded to my pathetic Facebook plea for some British teabags. A month or so later they were in the vicinity and before we knew it we were meeting up for a barbeque and the ceremonial handing over of a batch of hugely appreciated PG Tips. Aaah…. a lovely cuppa. Amongst other things we chatted about Brazil, as we were still humming and hawing about whether to make the massive trip. 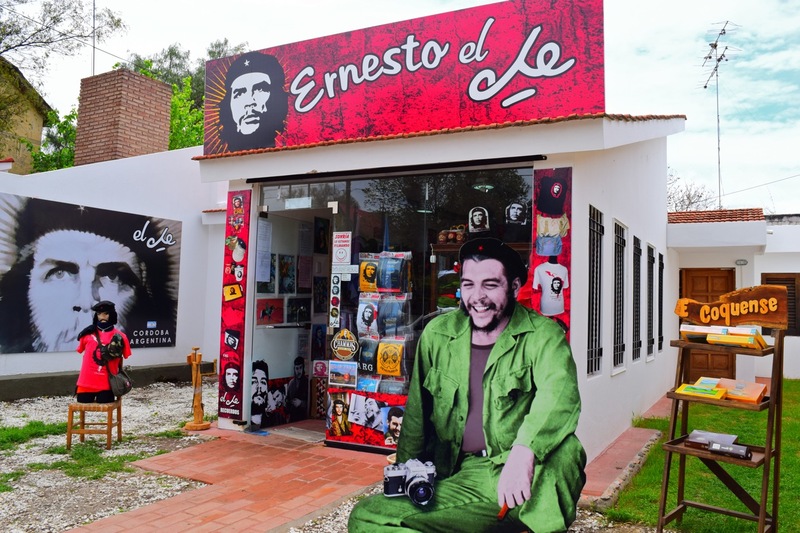 In lovely Alta Gracia we paid tribute to the revolutionary that graces more t-shirts than he could ever have imagined, Ernesto ‘Che’ Guevara, who lived in the town as a child. After wandering the family’s old home, now a museum and photo exhibition, we visited the new souvenir shop across the road. I think they succeeded in ensuring no one was in any doubt that this was the Che shop…. Souvenir shop across from Che Guevara’s childhood home in Alta Gracia, Cordoba, Argentina. Statue of ‘Ernestito’ (little Ernesto) at Che Guevara’s former family home in Alta Gracia. Jeremy has a little chat with Che. Che Guevara’s former childhood home in Alta Gracia is now a museum. We took the bus to the bright lights of Córdoba, which was our first cosmopolitan city day in a long while. 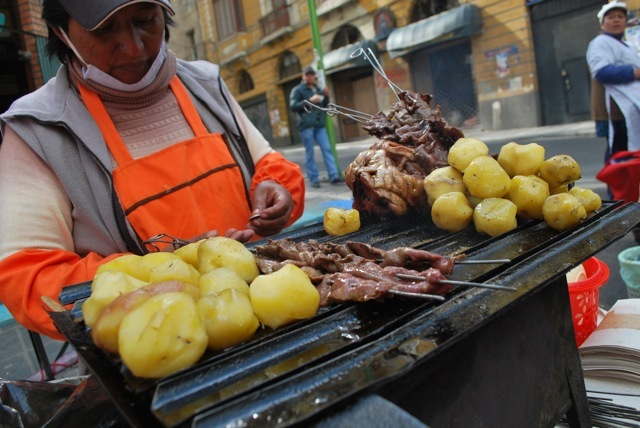 We made the most of it by pounding the streets, ‘doing’ the sights, and working up an appetite for a proper Argentinian parrilla lunch of grilled meat, with grilled meat and grilled meat. Clowning around at the cathedral, Cordoba, Argentina. Model of Eva ‘Evita’ Peron, Cordoba, Argentina. A little boy takes on the pigeons with gusto, Cordoba. This is what passes for a balanced meal in Argentina. Parrilla lunch, Cordoba. Córdoba’s massive student population helps to give it that hip edge. The fact that we were so excited by all the cool cafes, antique shops, market stalls and thronging bars made us realise we’d been knocking around in the backwaters for rather too long. To mark the occasion we had a cocktail before heading for the bus back to our provincial campervan. Early evening drinks in Cordoba, Argentina. We were getting some lovely sunny days but the spring weather was still pretty mixed, which only made us dream of Brazilian beaches even more. By the time we left the sierras we’d made a final decision that we’d keep heading east and go for it. 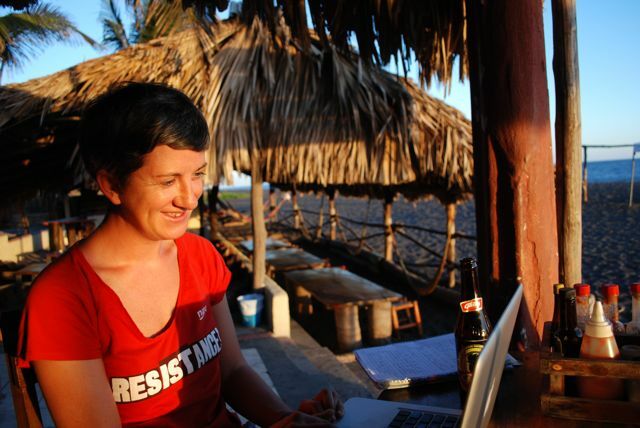 When we reached Santo Tome, on the Rio Paraná in Santa Fe, we were in organisational mode. We had this irrational compulsion to ‘get prepared for Brazil’, as if we were heading for some back-of-beyond third world country. This kind of thing happens to me even when we’re about to cross borders between the Spanish-speaking countries of Latin America. I start doing low-level panic-buying in case across the frontier ‘they’ don’t have certain foodstuffs or the brand of tea I like. We also knew wine was expensive and more limited in Brazil – into the trolley it goes! Being addicted to change doesn’t mean you don’t also fear it in some small way. With Brazil we had all the usual trivial uncertainties, but with the added complication that we don’t speak Portuguese. 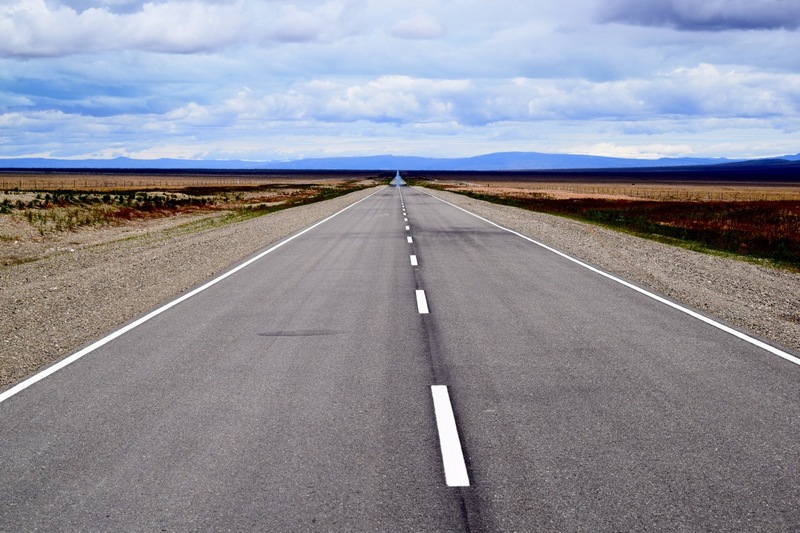 We were taking on a long drive in a relatively short space of time and had some fairly important things to sort out, which we really wanted to avoid having to deal with in a new language. 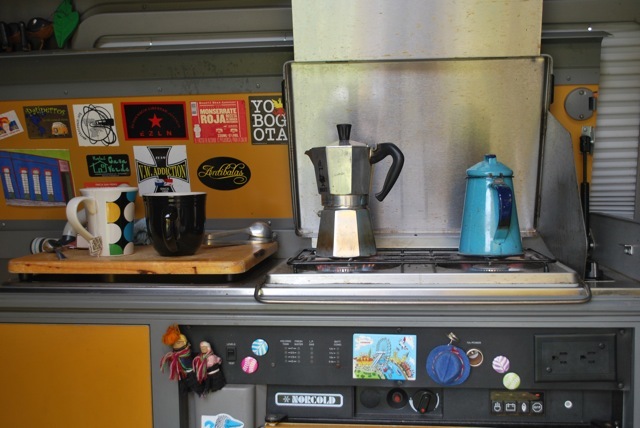 One of those was replacing our close-to-death auxiliary battery, which powers the campervan lights and some plug sockets and enables us to camp without external power for several days. Having to do ordinary things like find battery shops, launderettes, mechanics, ironmongers and the like gives us an excellent reason to spend time in ordinary towns. We really enjoyed our few days in the municipal site in Santo Tome, camping alongside seasonal workers and artesans, and pottering about doing our chores. 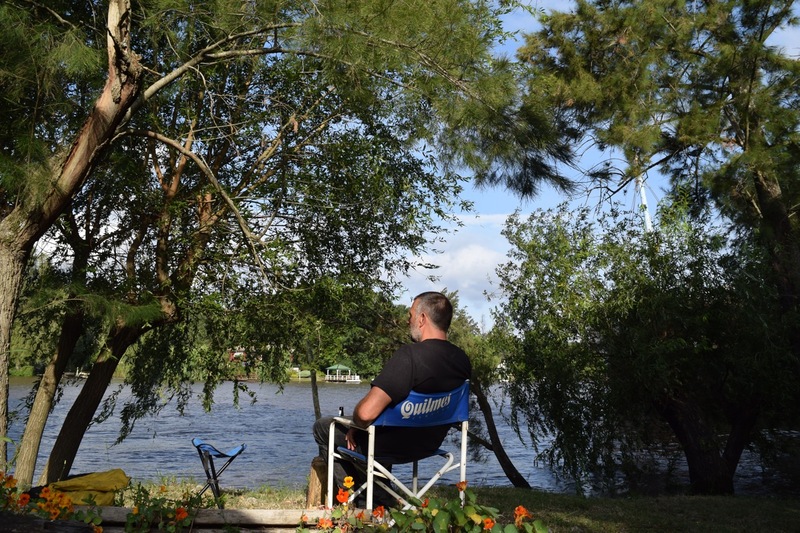 The site was right next to a long riverside promenade, where people jogged, played, fished, and passed the time with friends and the ubiquitous Argentinian mate (a bitter green tea) which most people carry on their person at all times. 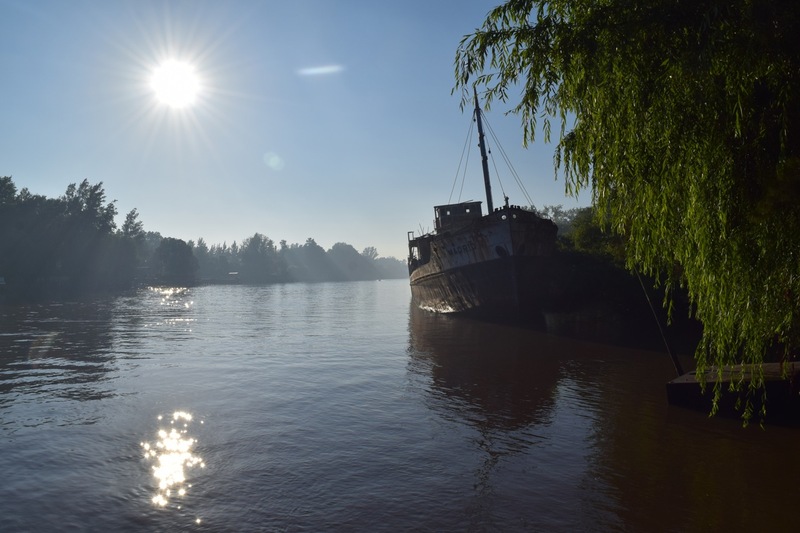 The riverside communities have a whole different feel to other parts of Argentina – there’s more languid strolling as smells of fried fish waft around, not unlike a seaside resort. The riverside towns can feel like seaside resorts. Rio Parana, Argentina. We even got the chance to go to an ordinary football match across the river in Santa Fe – a fine battle between two of the bottom teams in the premier league, Colón de Santa Fe and Arsenal de Sarandí. We’ve been to many matches in Latin America and one of the best things about them is being among the fans in the stands, who are as fanatical as it’s possible to be. The drums and singing don’t cease for the full 90 minutes, and goals are celebrated with the ‘hinchas’ (fanatics) conducting songs and chants from below. The hinchas rule the school, draping themselves from the fencing, shouting themselves hoarse at every turn in the game, hanging banners that talk of their willingness to die for their team and draping flags so huge that half the ‘hinchada’ can barely see the pitch. It said something about the, erm, enthusiasm of the Colón fans that they’d had to build a moat between the pitch and the stands. While we were waiting for our new battery to arrive we took off up the river to Cayastá. At the posh camping there we grilled some steaks and felt all summery as we looked out over to the river beach on a lovely evening. There were some pretty loud splashes in the water after dark. “Must be some massive fish in there,” we surmised. Next morning, this chap emerged from the water and came lumbering up the beach. This iguana wasn’t as grumpy as his face suggests. Cayasta, Entre Rios, Argentina. 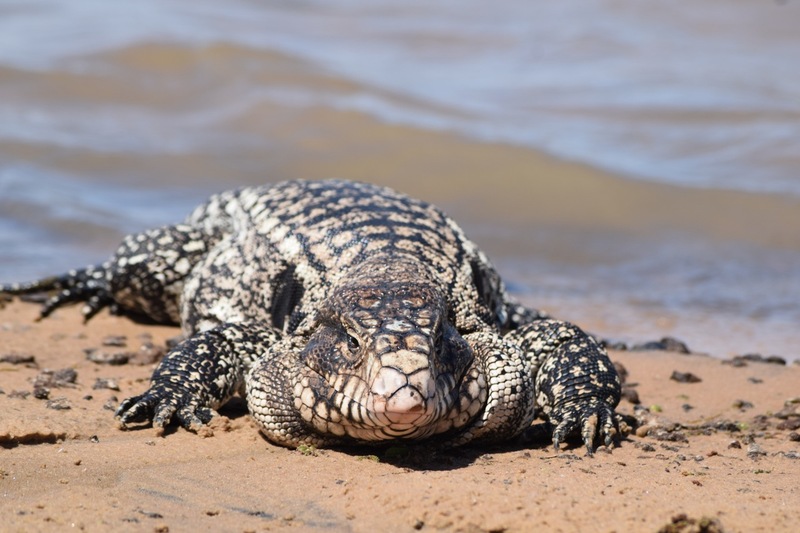 Mr Iguana emerges from the river in Cayasta, Santa Fe, Argentina. Shortly afterwards his friend came looking for some discarded fish heads, and got lucky. 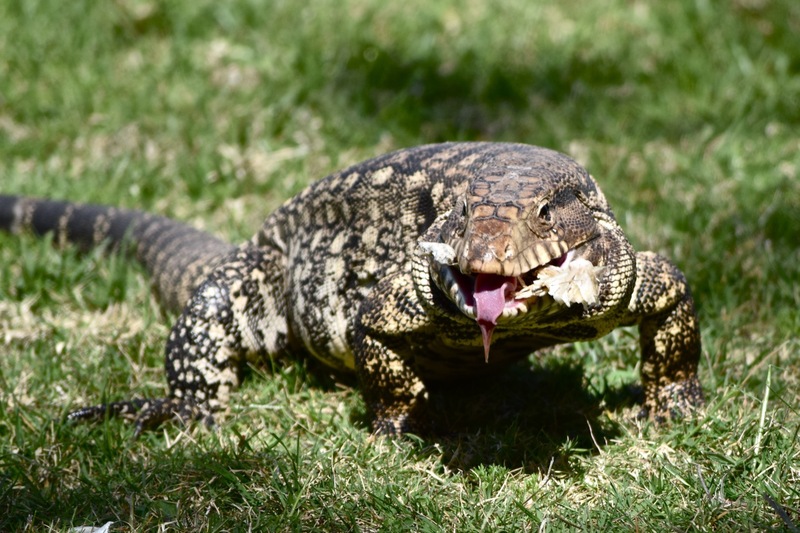 This iguana came up the beach to find discarded fish heads for snacking on. Cayasta, Santa Fe, Argentina. 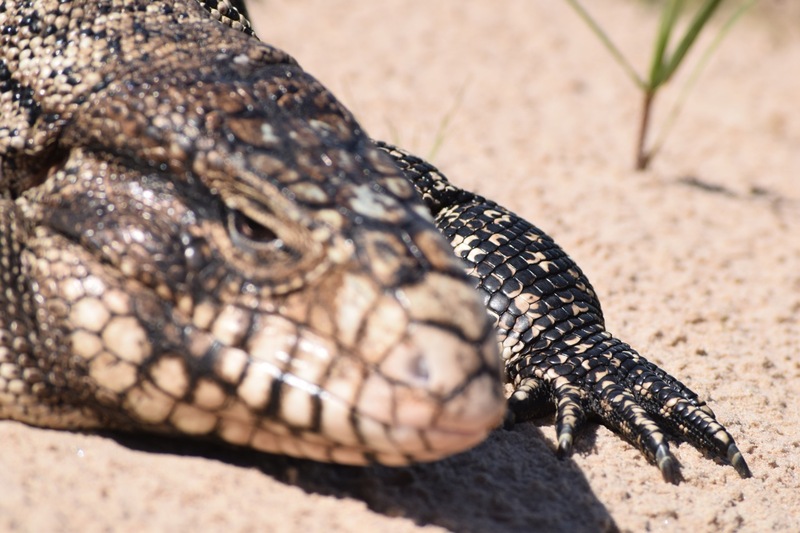 Despite our love of Argentinian steak, like Mr Iguana, we were pretty excited about being by the river and able to find some fish to eat again. 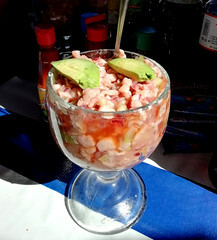 For our wedding anniversary we headed down the ‘coast’ to a fish restaurant in the tiny village of Los Zapallos. With its sandy streets and sleepy feel, it doesn’t look like the kind of place you’ll find a decent restaurant. But tucked away in the corner of the village, La Vuelta del Pirata has been serving up a well-regarded fish menu since the 60s. In true Argentine style it didn’t even open til 9pm. We sat down, starving. Señora Pirata (as she will henceforth be known) shuffled over in her cardie, doing one of those slightly scary auntie faces that is both stern and twinklingly kind. Before we could even speak she said: “It’s just fish, fish and fish, nothing else. I keep bringing it out, and you eat it!“. We took this to mean there was a fixed menu, but were a bit too dumbstruck to ask how many courses there were or what the price was. I asked in a quiet voice how much the wine was, not being comfortable with having to ask the price of something in a restaurant. In a voice a few decibels short of a foghorn she bellowed “IT’S 90 PESOS!“. We were really starting to like this woman – as my dad said when I told him about her, the world needs more eccentrics. The food started arriving and we wolfed it. Then more came, and more. We really should have asked what the menu entailed, so we could have paced ourselves. By the 8th course I had a haunted, begging look in my eyes, pleading ‘when will this stop?’. With each course we asked her what kind of fish was in the dish. Oh, she didn’t like the food being interrogated! After the umpteenth time, she waved her arm towards the other diners, shouting “they know, ask them how good the milanesa is, they’re my most regular customers!”. They nodded their approval. And it was, indisputably, delicious. All gut-busting 10 courses of it. Baked fish empanaditas, pate, fish ‘meatballs’, fried empanadas, breaded clams, milanesa with roquefort, fish lasagne, marinero (filet in batter with pepper sauce), whole grilled fish, and seafood casserole. As she removed the final dishes she cried out, “oh, I forgot to bring the fried fish!”. Señora Pirata’s idea of a joke – I wonder how long she’s been telling that one. When the bill came, the food amounted to just over £7 (US$11) a head. No joke. 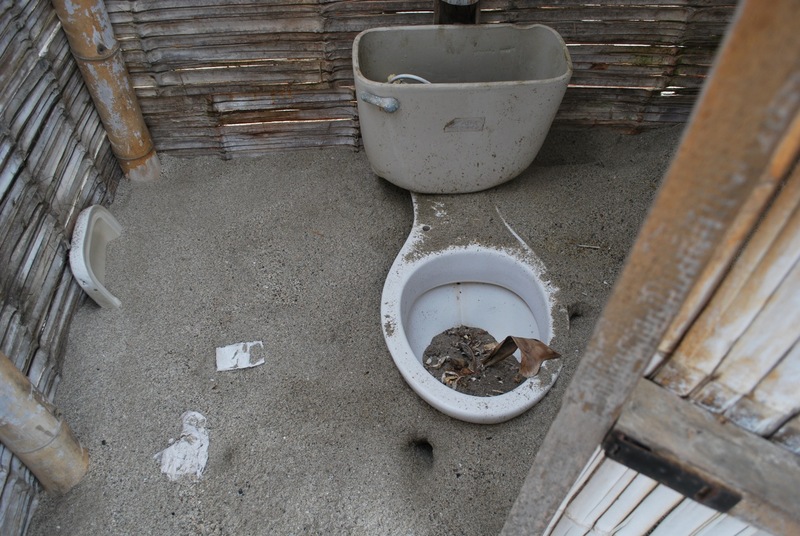 As a special gesture for our wedding anniversary, we slept in the van in the street outside the restaurant and used the pee bottle as a toilet. Romance is not dead. New battery installed, holes in exhaust repaired and laundry done, we headed across to Concepción, near the Uruguayan border, for yet more admin – such as the quarterly headache of filling the propane tank and paying the fine for having overstayed our Argentina tourist visa, to allow us to leave the country. We arrived looking forward to some camping on the Rio Uruguay, only to find the river was now on the road, and a guy was paddling around in a boat in what had been the campsite. “All the campsites in the town are under water!” said the helpful tourist information officer. Parts of Brazil were getting so much rain they’d had to open a dam upriver, flooding loads of places alongside it. Oh dear. Instead we set up base on the city’s shiny new costanera, a safely concreted promenade with some lovely views and sunsets. It was massive, with a free outdoor gym and parking for hundreds of cars, but we had the place to ourselves each night. Sleeping on the costanera, Concepcion del Uruguay, Argentina. The sunsets on the costanera were unbelievable. Jobs done we headed north towards the border, stopping off for a final dose of tourism at El Palmar national park. 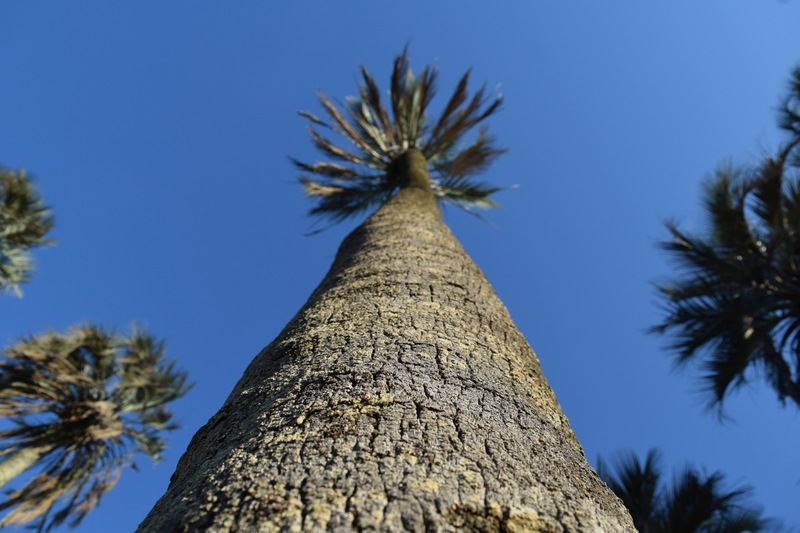 One of the last major protected areas for the massively tall yatay palm trees, it had sounded lovely when we read about it. But we weren’t quite prepared for the strange feeling of entering a tropical paradise just a few kilometres from the highway. As soon as we crossed the park boundary we saw fabulous, vivid birds, and hundreds of capybaras bathing in streams and ambling along the roadside. Curious little foxes stared at us from behind bushes, and in the evening little mustacheod viscachas (members of the chinchilla family) came trotting through the campsite looking for barbeque leftovers. Whistling heron, El Palmar national park, Argentina. A couple of young capybaras cross the road as we drive through El Palmar National Park, Argentina. A young fox checks us out, El Palmar national park, Argentina. Mustacheod viscachas have their burrows dotted around the campsite at El Palmar national park, Argentina. And then there’s those palm trees, looking resplendent in the daytime and posing obligingly before some perfect sunsets. As we made dinner, chicadas and frogs sang all evening. Yep, we were definitely getting that tropical vibe. 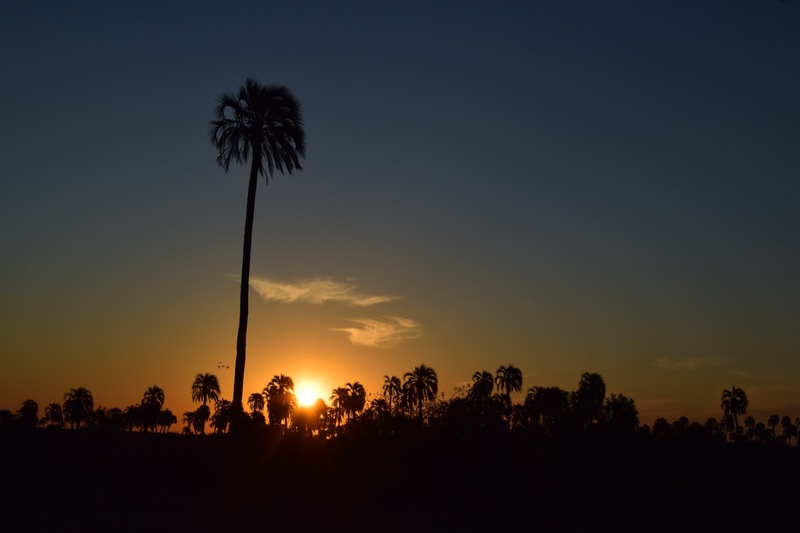 Yatay palms, El Palmar National Park, Argentina. Yatay palm, El Palmar National Park, Argentina. On the final push to the border, the weather deteriorated again. We re-visited a place we’d loved last year, where we’d crossed the border into Uruguay. This time it was soggy, windy and grey. We camped in a wet field further north. 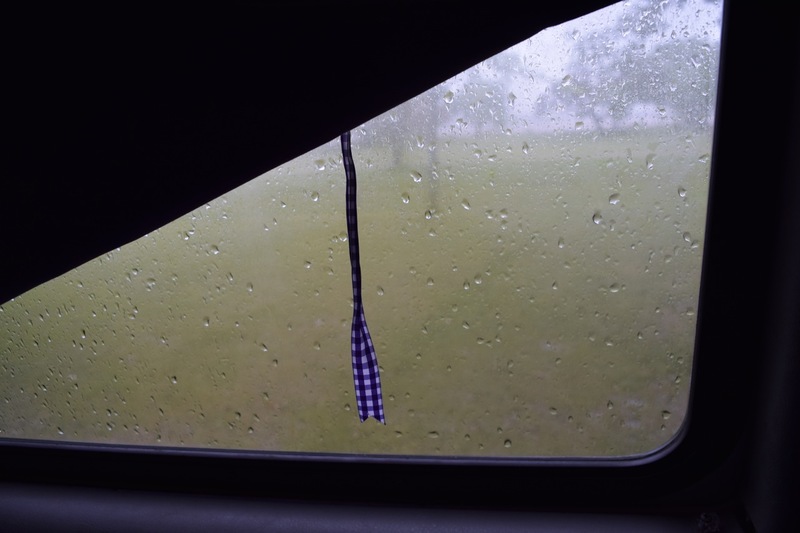 As fellow campers will know, those persistently rainy, chilly days are the most challenging. 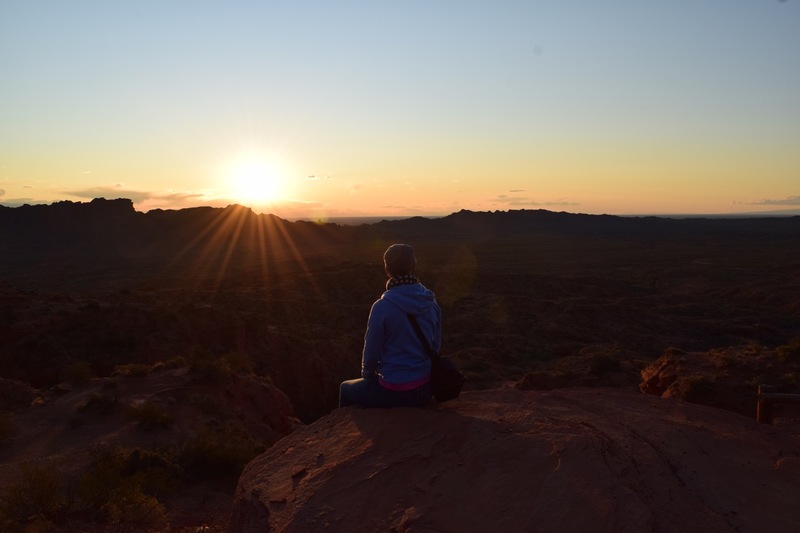 There’s often very little you can do, especially if you’ve gone somewhere for the outdoors, like hiking or mountain views. Spending a rainy day in the van is not like a cosy duvet day at home. You can tell yourself it might be nice to laze around in bed watching movies, but by 11am you pretty much want to scoop your own eyes out with a spoon. 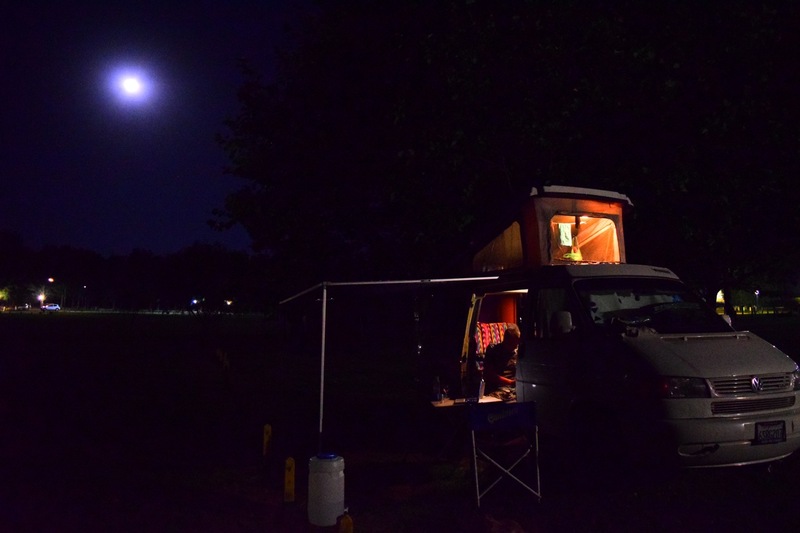 I’d go as far as to say that spending a rainy, muddy day in a campervan is about as appealing as – and not entirely dissimilar to – a damp fart in a spacesuit. So our instinct is usually just to try to drive away from it. Even when it’s futile, we feel we are at least using ‘dead’ time to make progress with the journey. This time, we had somewhere else to go. We were heading to a sunny beach and we’d picked a strip of white sand that was roughly 3,500km away from where we were sat. It was a long way and we really needed to get moving, so we packed up and made for the border. Things we now know to be true: You can never be too paranoid about running out of teabags. We walk to the river with the dogs every morning. If I had to select one word to sum up our time so far in San Rafael, it would be ‘wood’. 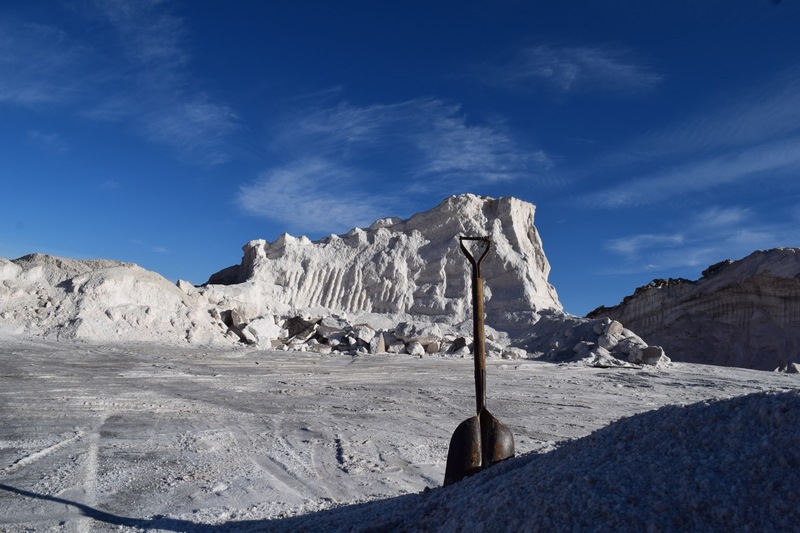 Cutting, felling, chain-sawing, gathering, dragging, rolling, splitting, throwing, snapping, sweeping, sorting, piling and burning the stuff has become a daily preoccupation during our work-exchange placement here in Argentina’s Mendoza province. We arrived here in early June and our stint is, unbelievably, already drawing to a close. Of course, there has been more to the last 12 weeks than just the wood thing. In fact, we’ve been rather busy and productive with all kinds of work and domesticity, plus a little bit of travel. We’ve been less diligent with the blog though, so to pick up where we left off we have to briefly skip back to May, when we took a month-long trip back to the UK to see family and friends. Let’s just say it involved a constantly revolving merry-go-round of hellos, goodbyes, trains, planes, pubs, lunches, dinners, large gatherings, small gatherings, far too many drinks, obscene amounts of food and plenty of laughs. We met new babies, clung pathetically to our ageing cat (now 21! ), gawped at our rapidly-changing nieces and nephews, and enjoyed spending time with ‘old’ faces. There is something a little bittersweet about these visits home. While the very purpose of being there is to see everyone, we just wish it didn’t have to be quite so intense and knackering. Poor us! We can hardly complain when it’s the path we’ve chosen and we’re lucky enough to be able to travel back to see people once in a while, but we do miss the everyday-ness of those relationships. This photo gallery sums up some of what went on, with apologies to those who have been airbrushed from history by my total failure to take any photos at several of our meet-ups, especially in London. 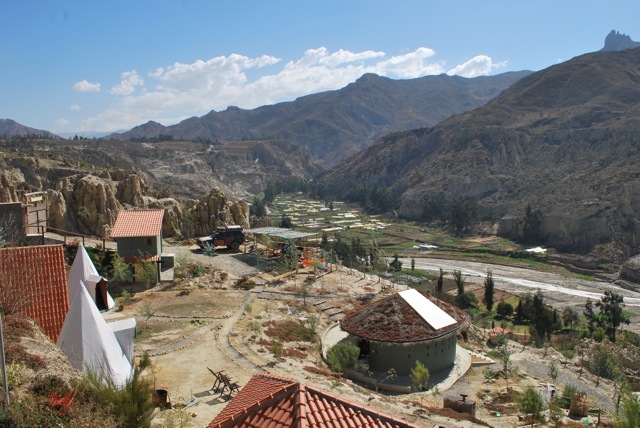 On our return to Argentina we came directly to the village of Salto de las Rosas, in the lovely San Rafael area, which was to be our home for three months. 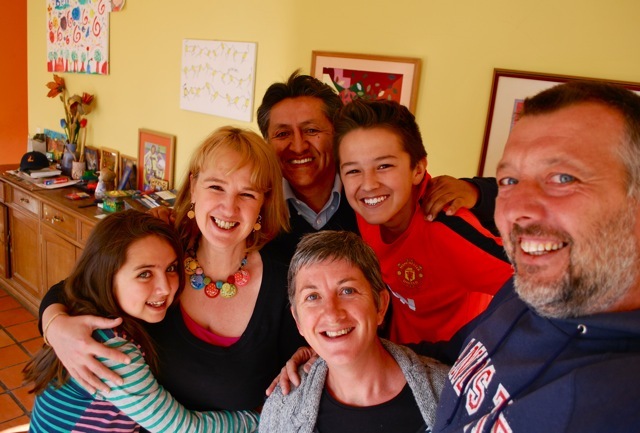 We’d already set up the placement – organised through Workaway – and had met our very welcoming hosts Susan and Dave before departing for the UK. It’s a straightforward exchange – Susan and Dave, who are UK/US expats, hire ‘Workawayers’ to put in four hours of work per day, five days a week, in exchange for free accommodation. One of the many reasons we’d applied was that the digs on offer was an entire two-bedroomed house on the land Susan owns. It was exactly what we wanted, so we could live independently and get stuck in to our own journalism work in our free time. 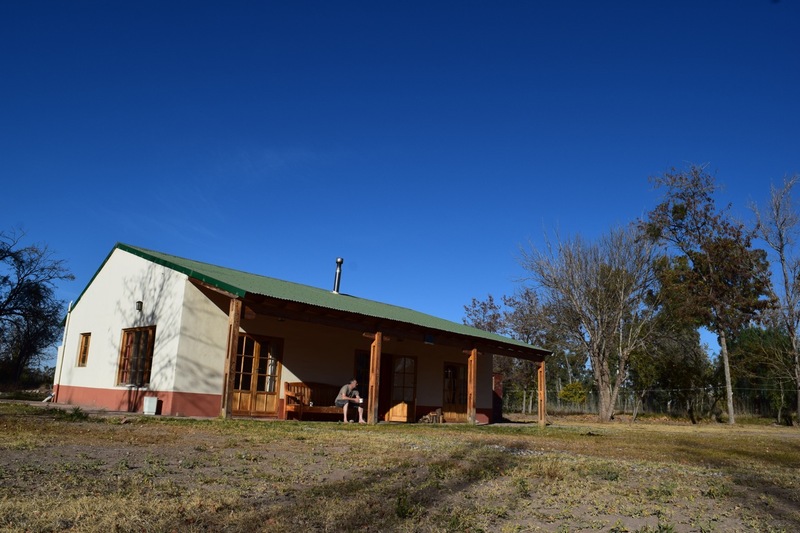 Our house – ‘La Casita’ – for the duration of our stay is just a holler from Susan and Dave’s. We soon settled into a routine of rapidly throwing on loads of clothes in the freezing early morning and heading out to walk Susan and Dave’s dogs – loveable clingy mutt Catorce, and bouncy young Rottweiler Cali. They’ve got used to our habits and are usually hurling themselves at the door in a fit of hysteria by the time we are putting our shoes on (the dogs, not Susan and Dave). Sometimes Catorce sleeps on our bed, just to be sure we don’t try anything sneaky like a lie-in. Catorce (right) and Cali go nuts for their morning walk. Hello, is it morning yet is it morning yet is it morning yet!! Catorce and Cali love playing on the river beach. Winters here get very cold at the start and end of the day, but are mostly dry, clear and sunny. Most mornings we can see the snowy Andes in the distance as we head down the path to a river that looks beautiful in the morning light. Until lunchtime we’re doing tasks around the garden, usually involving raking and burning mountains of fallen leaves, weeding, tidying, and doing that wood thing. Both our houses only have one source of heating – a wood fire in the living room. Additionally, Susan and Dave can only heat their water via a wood fire. That’s a hell of a demand for wood in winter. There are piles and piles of it outside their house – all different sizes and stages of seasoning. Wood, wood and more wood. We rake and burn a lot of leaves. Jeremy spends a lot of time splitting woods with this heavy log splitter. Aside from the need for stuff to burn, there are trees on the land that are dead, falling down or in dangerous positions and need to be felled. We’ve been learning a thing or two from Dave about avoiding a massive head injury while chopping down trees, and trying not to cut our hands off with power tools. Working together with a chain-saw has certainly brought a whole new element of trust to our marriage. All I’m saying is, just don’t make me angry. I’ve got a chainsaw, and I’m not afraid to use it. There’s something quite cathartic about chainsaw time. We also ripped down a crumbling car port and helped build a new one. Dave and Jeremy have started constructing a wood shed too. All from wood, obviously. Ta-da! Dave directs proceedings as we help build the new car port. Jeremy gets familiar with a circular saw as we help build the new car port. We helped Dave build this shiny new car port from reclaimed wood. Once or twice a week we gather with Susan, Dave and Susan’s daughter Tiv, to have dinner, drink wine, and display unnecessary levels of competitiveness while playing cards. Dave’s a musician and sometimes he gets the guitar out. Susan during one of our many dinners at their house. San Rafael is a wine-producing area and two of Susan and Dave’s close friends Sue and Malcolm – from the UK – own a small local vineyard and produce a gorgeous Malbec. Double bonus! We’re all keen on cooking, wine and talking, so it’s been great to enjoy several meals together. I’m already calculating how much of their wine I’ll be able to fit in the van when we leave. I mean, it’s not like I need all those clothes, is it? Malcolm and Sue’s vineyard, San Rafael, Mendoza, Argentina. Taco lunch with Susan, Dave, Tiv, Sue and Malcolm. Meanwhile our endeavours to get some paid work have been encouragingly fruitful so far. Our earlier research work in Welsh Patagonia resulted in four pieces for the BBC, including this audio slideshow and a feature on my impressions of the area, plus an article on the story of Welsh afternoon teas in Patagonia, in new online magazine Cultures & Cuisines. Jeremy is currently writing an eight-part series for a geeky VW magazine in the UK, and continues to get some work for union magazines. He’s also becoming a shipping bore, writing articles for the journal of shipping union Nautilus, including large features on Argentine naval policy and the new Nicaragua canal. We’re also working together on a project to write web content for a campaign group in the UK. Living in a rural area can make internet-reliant work frustrating though. We have a limited daily internet allowance, and even when it’s working it’s often refusing to co-operate. We are occasionally found to be smacking our foreheads against the laptop, and sometimes drive 28km into San Rafael city to get things done more quickly. As with our previous stints at living in a house, it’s good to catch up with things that get neglected when we’re always on the road. Boring stuff like getting new glasses, washing things that are continually dirty but have to be ignored, and working through the never-ending list of van maintenance. 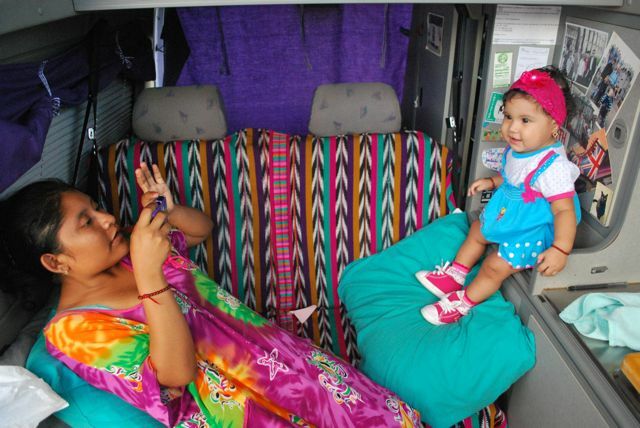 If you’re wondering why there seem to be fewer van dramas these days, it’s partly because our earlier issues have helped us be a little bit more zen about these things, and partly because Argentina has been kinder to us. Of course things still break sometimes, but on every occasion so far we’ve either been carrying the part or been able to source it here, which saves a huge amount of time, money and stress. So life has been relatively sedate , but it’s not been all work and no play. Whenever possible we’ve been spending weekends exploring the province and enjoying some brief returns to the camping life. 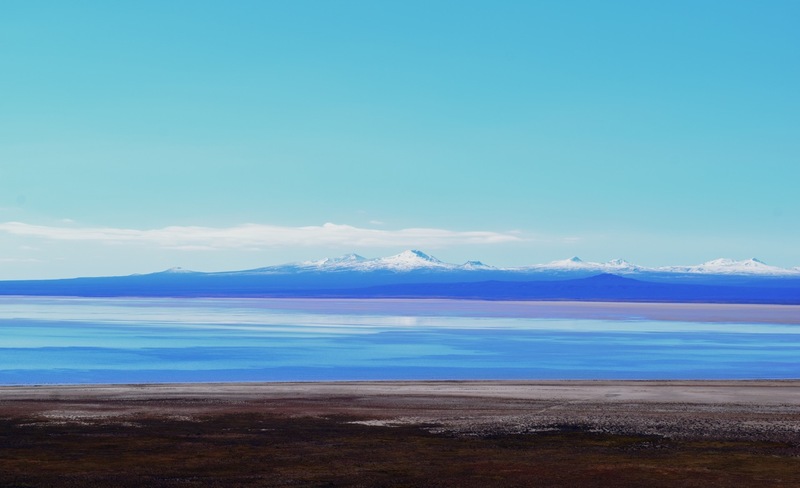 There are some fabulous landscapes right on our doorstep, like the colourful rock formations around Valle Grande, the shimmering El Diamante salt flats and the road to the snowy mountains of the nearby ski resort of Las Leñas. 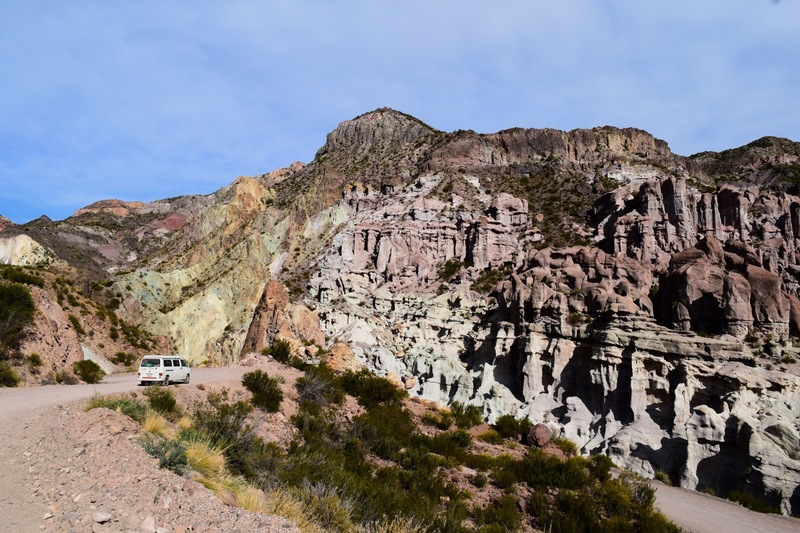 Driving through the Atuel canyon from Valle Grande was a constantly changing colourscape. Salt mine, Salinas del Diamante, near San Rafael, Mendoza province, Argentina. Some places are amazingly low key. There’s a tiny, rusty old sign for Laguna Blanca at a gate by the side of the road to Malargüe. We drove up it to find an entirely deserted, phenomenal mountain lake. Laguna Blanca on a quiet Sunday. The sign to Laguna Blanca was somewhat under-stated. 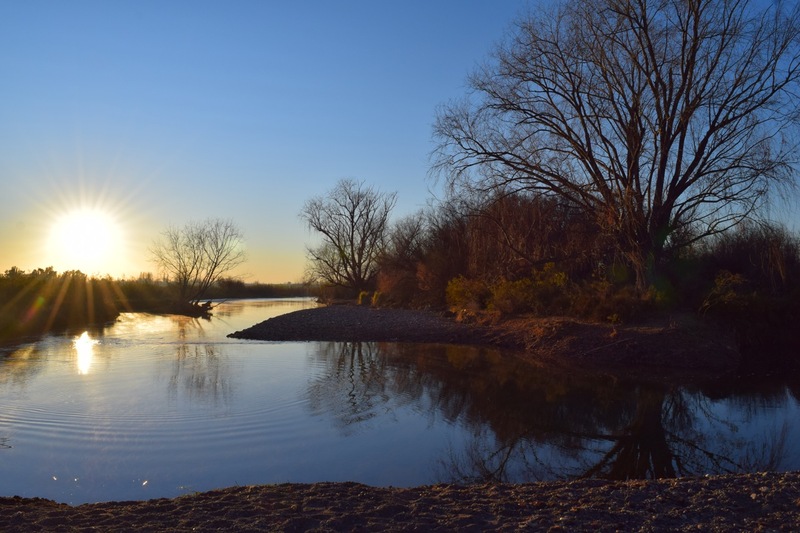 Laguna Blanca was empty, beautiful and still. 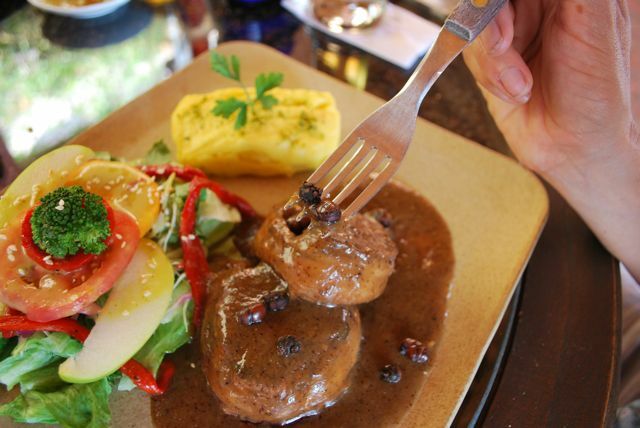 I wouldn’t say we’re bored of the red meat culture in Argentina (is that even possible?) but we were beside ourselves with excitement to visit a trout farm near Malargüe that has a restaurant and campsite attached. Fresh fish! So fresh that we watched it being selected from the pond and gutted on the spot less than half an hour before it arrived on the plate. Not only did we eat baked trout for lunch that day, but the set menu was a trout-fest of pate, mousse, empanadas, smoked trout and more. Trout pate and smoked trout, Cuyam-Co trout farm, near Malargue, Mendoza province, Argentina. 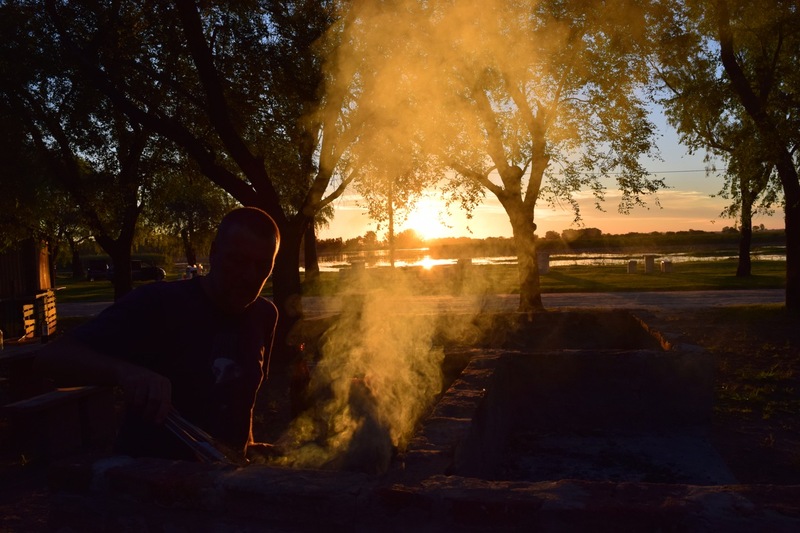 Steamed trout and potatoes, Cuyam-Co trout farm, near Malargue, Mendoza province, Argentina. Gaucho, seen while we were walking near the trout farm, Malargue. This area is full of dams for hydro-electricity and the resulting reservoirs are invariably stunning. The nearby Los Reyunos area has been lovely for some walks and picnics. Los Reyunos reservoir, near San Rafael, Mendoza, Argentina. Cuppa time at the Club Nautica, Los Reyunos, near San Rafael, Mendoza province. Of course we couldn’t be here and neglect to pay attention to some vineyards. On a grey weekend in the nearby Valle de Uco we toured a couple of vineyards and indulged in some tastings, punctuated with a beautiful lunch in the town of Tupunganto. We’ve had a few chilly nights camping in recent months, but this one took the prize when we woke up to sleet. We realized we’re turning into wimps when we headed straight home for some warmth. Wine tour and tasting at Bodega Salentein, Valle de Uco, Mendoza, Argentina. Wine tour and tasting, Bodega Salentein, Valle de Uco, Mendoza, Argentina. Bodega Salentein is beautifully designed and even includes an art gallery, Valle de Uco, Mendoza, Argentina. Wine bottles, Bodega Salentein, Valle de Uco, Mendoza, Argentina. We woke up to sleet in Valle de Uco. Brrrr. Well, we thought that had taken the prize until we decided to visit the Parque Provicial Payunia, a reserve near Malargüe which has the world’s highest concentration of volcanic cones – around 800 in a 4,500-sq km area! It’s a low key place with not a lot of information, inadequate mapping and a lack of infrastructure. Okay, so it’s mid-winter but we can never resist a volcano, nor a challenge, so off we went. 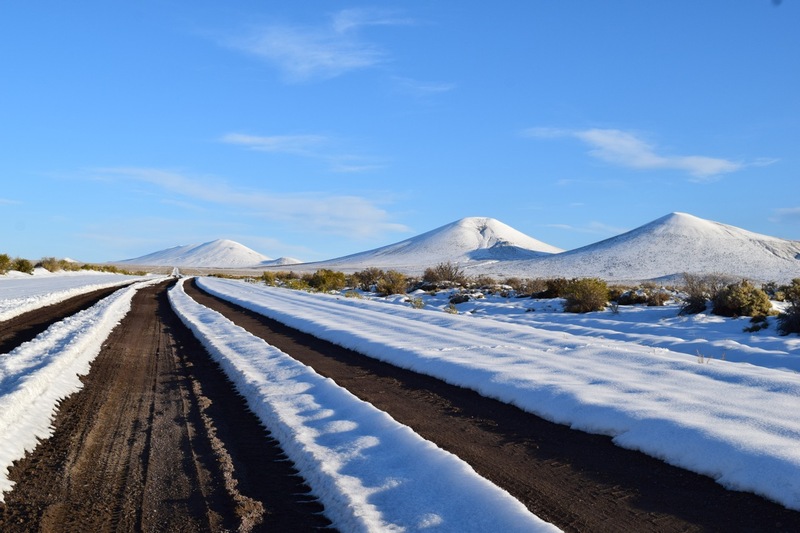 We were surprised but excited to see some snow at road level as we drove the back dirt-road from El Nihuil to the boundary of the reserve. As dusk fell the snow levels increased and we started to wonder what was ahead, but found it hard to care because the horizon was just full of snowy volcanic cones and the views incredible. As we drove south from El Nihuil, the amount of snow gradually increased. We’d planned to just get as far as possible that night and pull off somewhere on the road to sleep. But the snow was increasingly banked up over the roadside ditches and we couldn’t find anywhere to stop. After a few hours, at dusk, we came across some guys in a truck who advised us to drive 10km onwards to a house that had space we could probably use. After about 20 miles we were still driving, the road was getting increasingly slippy and we’d given up on the house. 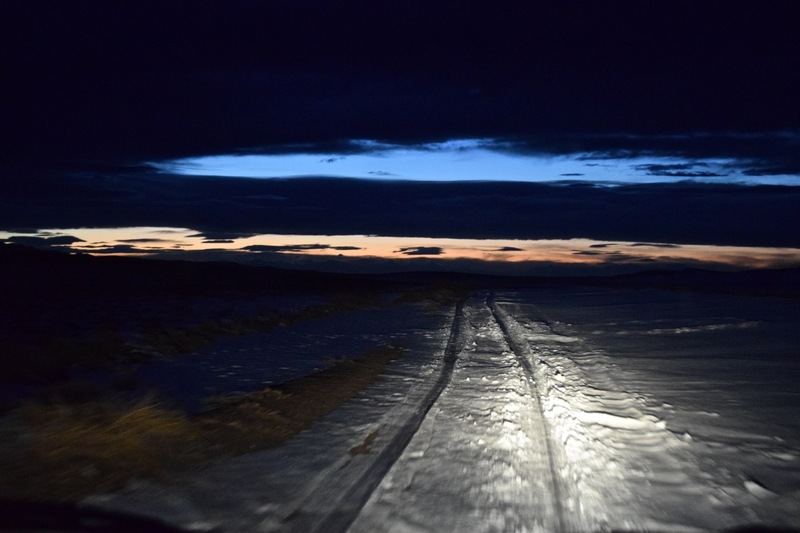 Driving on snow, in the dark, hadn’t really been in the plan. Road from El Nihuil Mendoza province, Argentina. Just then we saw the lights and pulled in. 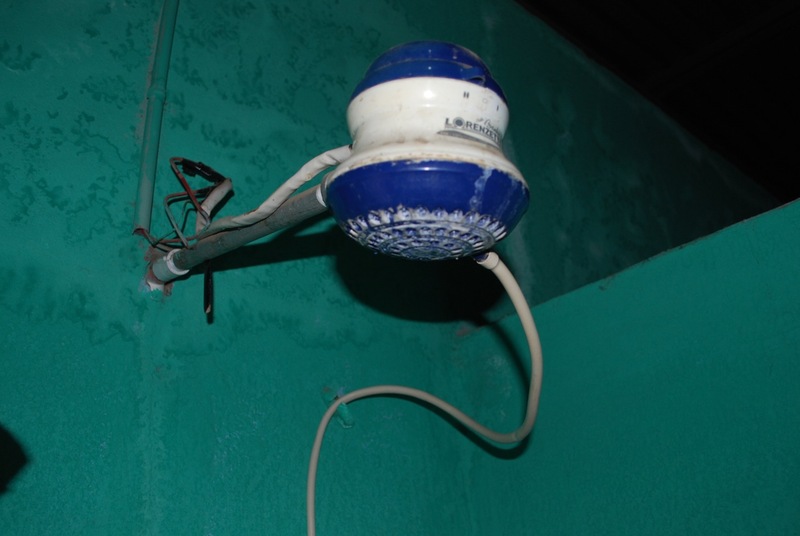 The bemused owner and his son came out to investigate – what they made of the gringos turning up in the dark in such a remote area, we’ll never know. They, of course, agreed to let us stop and sleep next to their place, where there was some flat gravel to park on. 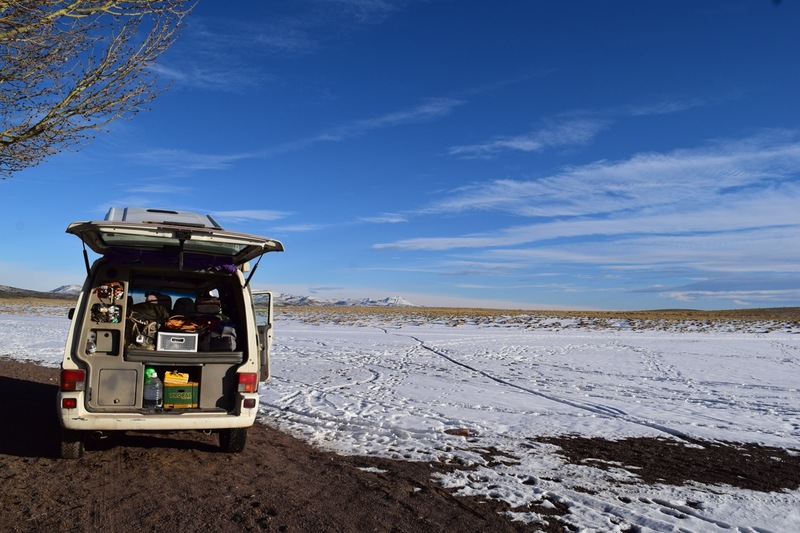 Next morning we work to a lovely crisp snowy scene, and moved on to the eastern side of Laguna Llancanelo, a phenomenal lake at the edge of the reserve. From our camping spot Jeremy counted 39 visible volcanoes. 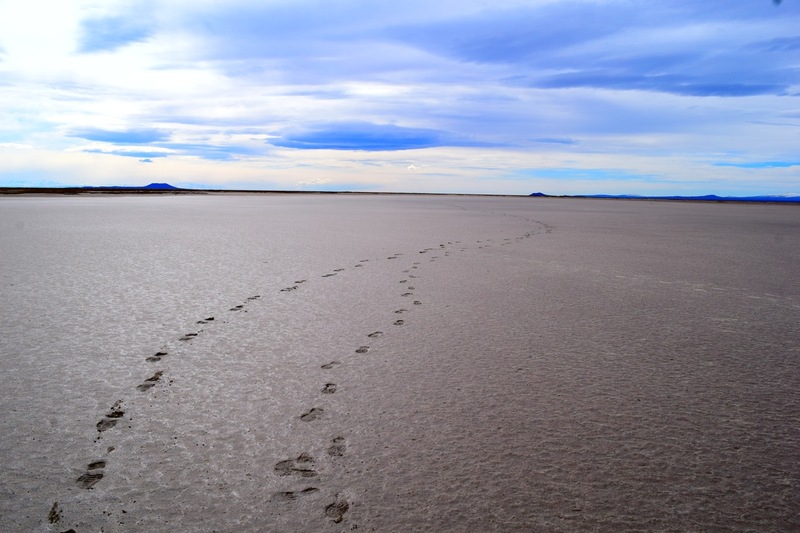 We walked out on to the dry lake bed, seeing water in the distance but never reaching it. 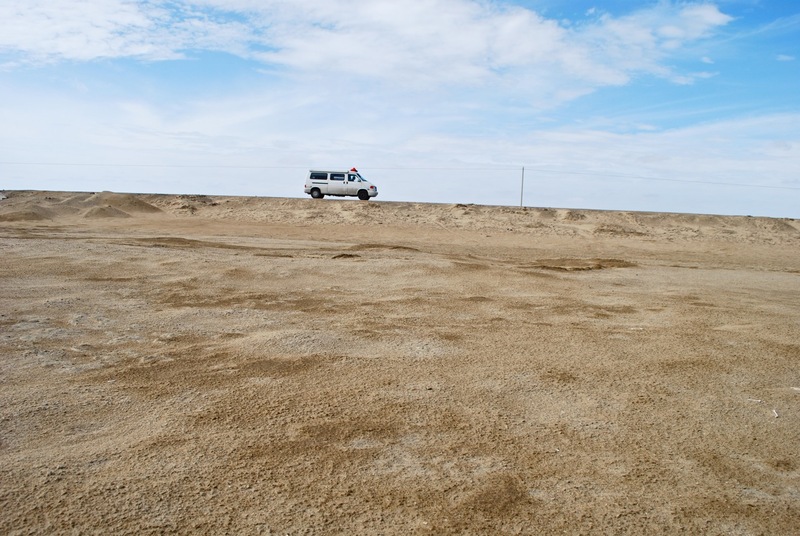 A local gaucho cycled over from his house to see if we’d broken down, and told us that part of the lake had been dry for years. We camped next to a dry section of the lake bed at Laguna Llancanelo, Mendoza province, Argentina. Next day we drove to the lake’s ‘official’ entrance and were directed by the park guards to one of the most incredible viewpoints we’ve encountered on this trip – an easily-accessible volcano top with 360-degree views of the snowy Andes, countless volcanoes and the flamingo-rich Laguna Llancancelo. We spent an hour there on a gloriously sunny Sunday, and not another soul came. It was an amazing weekend, but for the first time we did have to resort to sleeping with the full complement of thermals, sleeping bags and all our blankets. It’ll be back to full-time camping when we leave here in September, so it’s time to toughen up again. What’s the plan post-San Rafael? That’s a very good question and kind of depends on what day you’re asking. 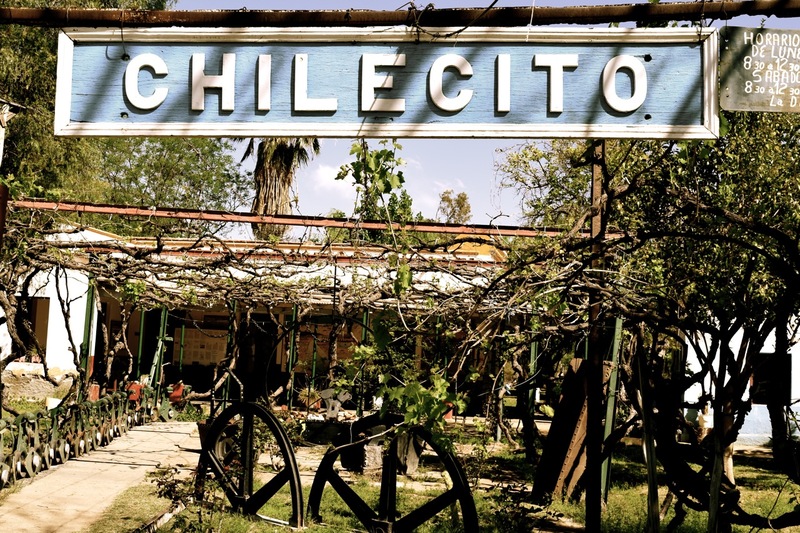 We’ll most likely head to parts of central Argentina that we haven’t yet visited, and return to some places in the far north that we loved when we first arrived in the country a year ago. Whatever happens, let’s hope the nights start to get warmer when we hit the road again, because we’ve become just a bit too accustomed to that roaring wood fire. Things we now know to be true: There’s no way of knowing how much wood a woodchuck could chuck. IT’S A BUMPER CROP… MORE PHOTOS BELOW! The drive south to Malargue is stunning, and the province is full of these fabulous old car and pick-ups. Mural showing Che and Alberto (Motorcycle Diaries) – ‘Latin America lives! Follow your dreams’. Antenna at the European Space Agency’s Malargue tracking station. Cloud looms over a dry section of the lake bed, Laguna Llancanelo, Mendoza province, Argentina. Selfie from Volcano Trapal, overlooking Laguna Llancanelo, Mendoza province, Argentina. This luminescent lagoon has a familiar legend about two young lovers, a forbidden relationship and a watery double suicide. The snowy mountains looked like they were levitating. Laguna Llancanelo, Mendoza province, Argentina. 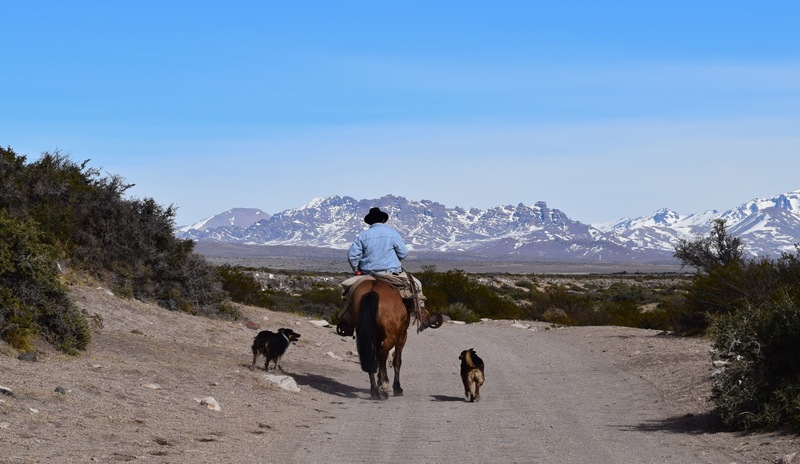 Walking around Los Reyunos, near San Rafael, Mendoza province, Argentina. Best ham and cheese sandwich in Argentina ever. Fact. El Sosneado, Mendoza province. Valle Grande, near San Rafael, Mendoza province, Argentina. Parque provincial Payunia is like one huge lava field. Reflections at Salinas del Diamante, near San Rafael, Mendoza province, Argentina. Castillos de Pincheira, near Malargue, Mendoza province, Argentina. Birds take flight, near Laguna Llancanelo, Mendoza province, Argentina. The views on the road to Payunia were incredible. Driving towards Las Leñas ski resort, with an early-winter dusting of snow. Laguna Blanca, Mendoza province, Argentina. Big scary sink hole on the road to Las Lenas ski resort. Driving towards Laguna Llancanelo, Mendoza province, Argentina. Atuel Canyon, near San Rafael, Mendoza province, Argentina. Driving south from El Nihuil, there were volcanic cones all around us. 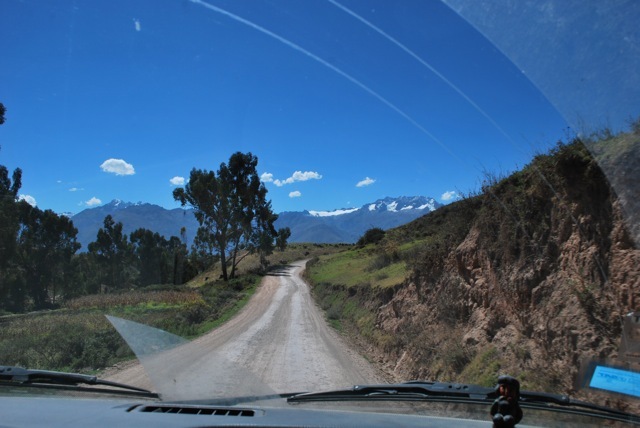 Driving from El Nihuil to Parque Provincial Payunia. Cuyam-Co trout farm, near Malargue, Mendoza province, Argentina. Pre-trout lunch walk near Malargue, Mendoza province, Argentina. This massive tree gave us a bit of trouble and eventually had to be dragged down by a tractor. Jeremy and Dave hit the Andes beers. Susan and Sue, Salto de las Rosas, San Rafael. Ice on the inside of the van! Frosty morning at Malargue municipal campsite. Susan’s land stretches all the way to this beautiful river. We arrived in Buenos Aires on an overnight ferry, bleary-eyed and begging for more sleep, and things pretty much continued that way until we left a month later. BA is the kind of city that you gorge on until you feel a bit sick. So many atmospheric bars, quality restaurants and little pavement cafes give it a decadent Parisien feel. Tempting treats like platters of cheeses and cured meats are practically waved under your nose every time you order a drink. Amazing cakes and ice creams leap out as you try to innocently walk along the street. There’s steak and wine everywhere. Even the bloke at the greasy sausage sandwich stall in the market sells red wine by the glass. Bloody hell, what’s a person supposed to do? Like a couple of kids who hadn’t seen sweets in years, we crammed everything in until our cheeks bulged. As if all of this isn’t bad enough for you, everything in BA happens exceptionally late. Turning up to a restaurant before around 10pm more or less makes you a social leper. Steak houses are rammed by 11pm-to-midnight. Most bars only get going sometime after this. This’ll perk you up. Bar Plaza Dorrego, Buenos Aires. So not only are you getting fat and pasty, you’re knackered as well. I realise that makes me sound like a whining old lady. We had a blast, although we were certainly woefully lacking in training for the city life. Years of living on the road and camping had got us into a routine of early starts, active days and ridiculously early nights. 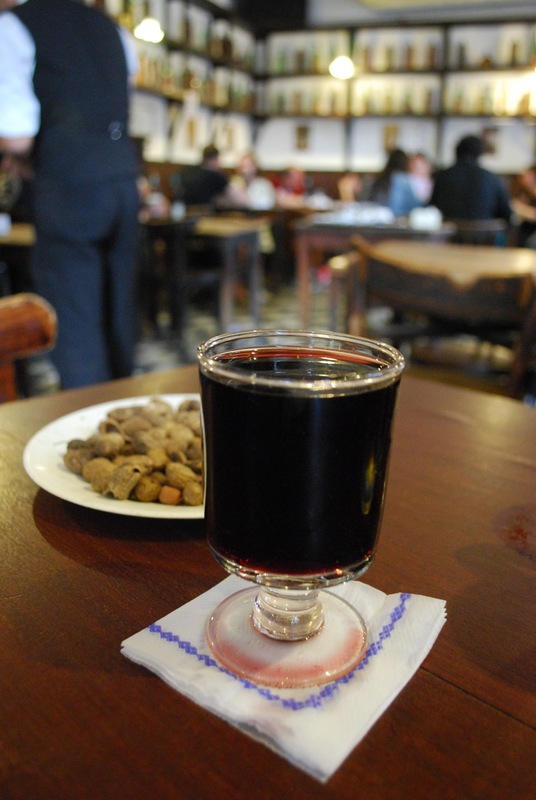 Most other countries in Latin America exist on a different schedule to Argentina – meals are eaten early and (except for in larger or more touristy cities) going out late for drinks is not really the norm. We’d got used to that, but we were up for the BA challenge – it was sink or swim. Our friends Karen and Gustavo, helped set the scene when we arrived at their apartment from the ferry port. “We’ll have dinner later and go out to a bar tonight,” they said. After dinner we went out. It was 12.30am. By about 3.30am we cracked. We’d been awake for about 25 hours straight, so left Karen and Gustavo in the bar and went home. The next morning Karen got up and went to sit a Portuguese exam, having had about 90 minutes sleep. She passed with flying colours. We realised what complete wimps we had become. We had a bit more time to prepare for their welcome barbeque with some friends a few days later, which slowly got going at about 10pm and, in true Argentine style, involved enough meat to feed a small town. This small parrilla for seven people includes bife de chorizo, matambre, tire de asado, chorizos, provolone, peppers stuffed with egg and cheese and a butternut squash. 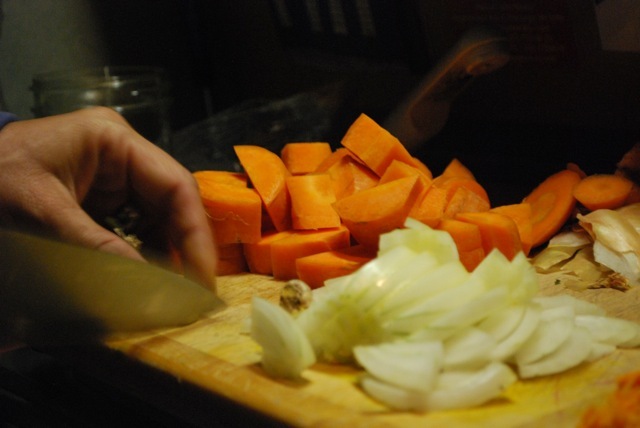 Gustavo and Karen prepare the meat and veg for the parrilla, Buenos Aires. Karen gets ready to take the first trolley of food and drinks out to the parrilla. Over the next few weeks we consolidated our initiation with some more training, helpfully aided by our overlanding friends James and Lauren, who have this uncanny knack of getting everyone around them completely roaring drunk, without anyone realising quite how it happened. It was great to coincide with them again in one of the continent’s most renowned party cities. What could possibly go wrong? 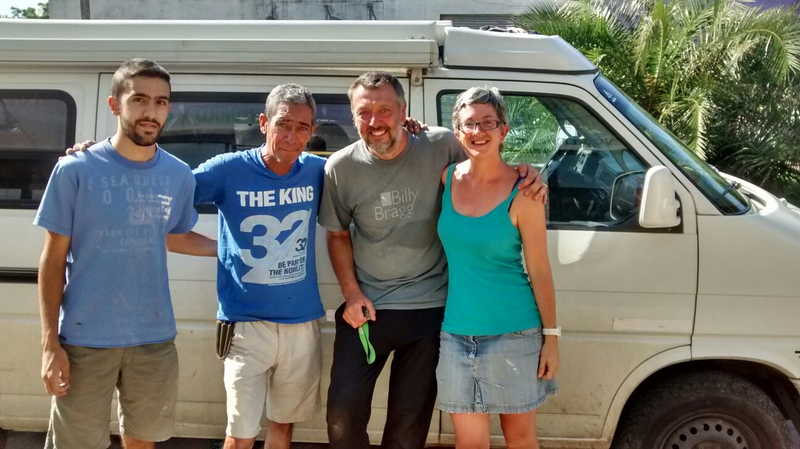 We also reunited with Marek, whom we´d first encountered with his partner Zuzka in Puerto Iguazu, and finally met Stevie, Tree and little Sol from Sprinter Life, who’d been travelling around in their van for five years and were preparing to return home to the US. Added to that were new overlanders Rike and Martin, which made quite the little crowd. The over-excitement of having a proper social life again only added to the kids-in-a-sweet-shop atmosphere. Lively night in El Federal with James, Lauren, Marek, Rike and Martin. Pre-drinks drinks in our apartment with James, Lauren, Rike and Martin. -course tasting menu Stevie and Tree at Casa Coupage, Palermo, Buenos Aires. It would surely bore you silly to read a list of all the meals and wine-soaked nights we had. Some of it´s covered in the photo gallery below, but stand-outs include a couple of stupendous steak nights at Gran Parilla de la Plata in San Telmo with James, Lauren and co, great seafood at El Obrero in La Boca, and a sublime way-off-budget meal at Casa Coupage with Stevie and Tree, that involved a 7-course gourmet Argentine tasting menu and a wine-tasting menu so extensive that Tree remembers very little about what we ate that night. James takes on another huge Argentinian steak, La Gran Parrilla de la Plata, Buenos Aires. Entrada of liver pate in pastry: We splurged on a 7-course tasting menu and 5-glass wine tasting at Casa Coupage, Palermo, Buenos Aires. Course two: We splurged on a 7-course tasting menu and 5-glass wine tasting at Casa Coupage, Palermo, Buenos Aires. Course three included home made chorizo, sweetbreads, squid and tuna carpacchio: Splurging on a 7-course tasting menu and 5-glass wine tasting at Casa Coupage, Palermo, Buenos Aires. Patagonian lamb with coconut potato cake: We splurged on a 7-course tasting menu and 5-glass wine tasting at Casa Coupage, Palermo, Buenos Aires. Lomo milanesa; We splurged on a 7-course tasting menu and 5-glass wine tasting at Casa Coupage, Palermo, Buenos Aires. Over our time there we said farewells to Marek, James and Lauren, and Stevie and Tree, who were all at the end of their long road trips and heading home. While we were sad, our livers were quietly grateful. Of course there were sensible, practical and cultured things to be done as well. As with most of our visits to a major city, there was maintenance work to be carried out on the van. We already had a list of jobs planned, which became a bit longer when we were driving to our apartment on day two and heard a rather loud clunk every time we turned a corner. 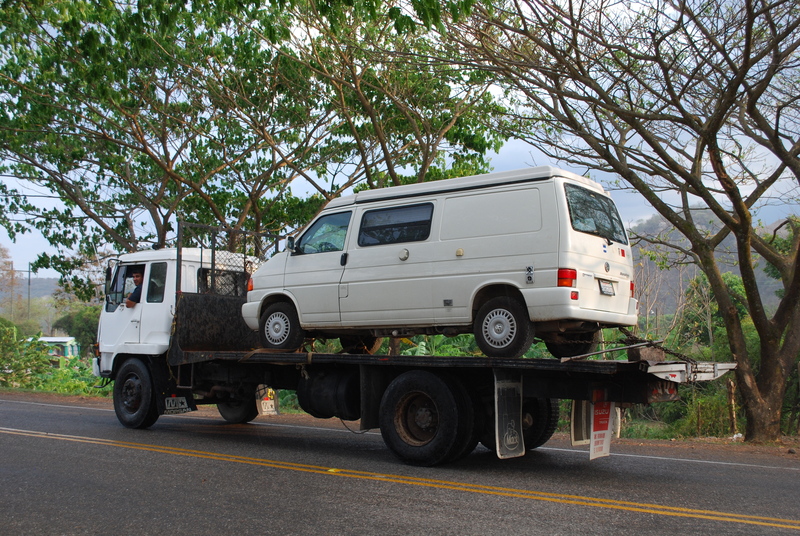 Thankfully, we again had the required parts – ball joints and a tie rod end, if you really want to know – stashed in the van, so no drama there. [makes a change – ed]. We ran in the park and walked all over the city – visted Evita’s family vault at the grand cemetery of La Recoleta, gazed at the Casa Rosada, wandered the streets of La Boca with Karen and their little boy Santino and later went to a roaringly loud Boca Juniors game at the stadium. Living in an apartment in San Telmo gave us easy access to its lovely Sunday market and numerous little quirky shops and cafes. We went to a tango show at a cultural centre, and watched an outdoor milonga (tango club) in the square near our place. Tango dancers at an outdoor milonga, Plaza Dorrego, San Telmo, Buenos Aires. A tourist joins in with a street singer in San Telmo, Buenos Aires. Soda siphons for sale, San Telmo market, Buenos Aires. Lots of antiques and bric-a-brac for sale at San Telmo Market, Buenos Aires. Browsing at San Telmo market, Buenos Aires. And on a more serious note, we were fascinated by watching the Madres de Plaza de Mayo on their weekly march in the plaza near Casa Rosada, and by our trip with Karen and Gustavo to the former Naval academy ESMA, an ex-detention and torture centre which we covered in the last blog post. 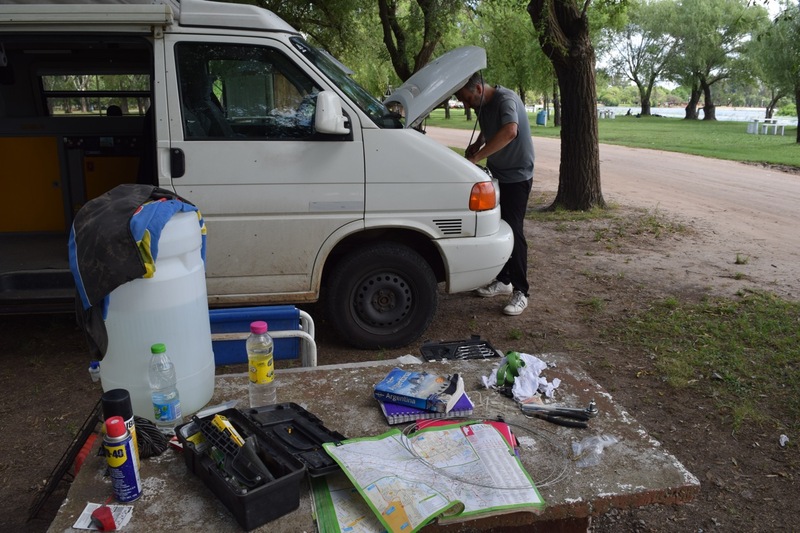 Much of the internet we have found on the road in Argentina has been surprisingly poor, so we also used the time to catch up on some jobs and admin, including arranging some things for my parents’ upcoming trip to Patagonia. 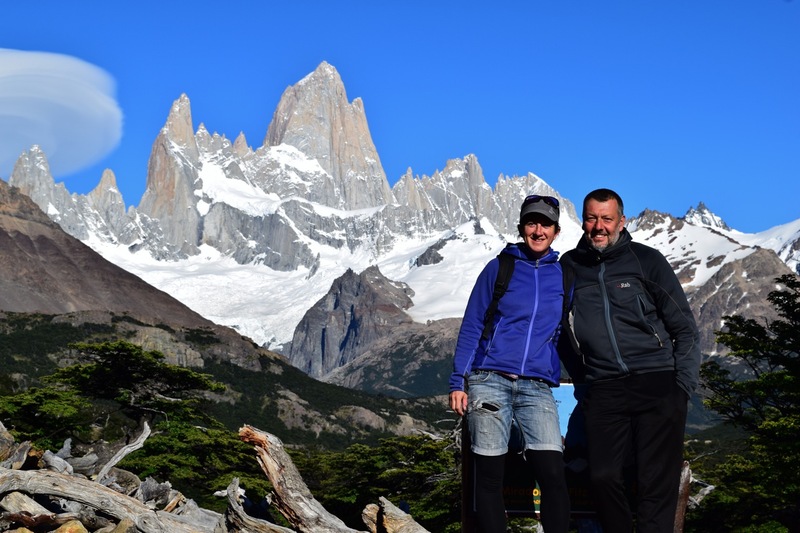 When we left BA, we would be driving 1,600km over a few days, to meet them in San Martin de los Andes, in northern Patagonia. I wasn’t wrong. But little did we know that late spring in San Martin could mean actual snow blizzards. Little did we know that the very day they were travelling was to coincide with the start of some remarkably extreme weather in Argentina. And little did we know that San Martin’s airport was not equipped to cope with landing planes through a puff of cloud, never mind an all-out blast of snow from the Antarctic. No, that was all to come. Things we now know to be true: You can plan all you like. MORE PHOTOS IN THE GALLERY BELOW..
Travelling from Montevideo to Buenos Aires by ferry at sunrise. Statues of Argentine icons Diego Maradona, Eva Peron and tango singer Carlos Gardel, in the barrio of La Boca, Buenos Aires. The port area at Puerto Madero, Buenos Aires, has been spruced up and gentrified. Drinks in Bar Plaza Dorrego, Buenos Aires. A rather sozzled late-night snap with the ultimate drinking buddies, James and Lauren. One of my favourite buildings in San Telmo, Buenos Aires. Argentina: Enjoying a food fair in Palermo with James, Lauren, Rike and Martin. Eva ‘Evita’ Peron is idolised in Argentina. Karen prepares stuffed zapallitos and patacones for lunch, Buenos Aires. Casa Rosada,the presidential palace, Buenos Aires. Mural near the Casa Rosada lamenting the Malvinas (Falklands) war and declaring the islands belong to Argentina. Gustavo and Santino, on a trip to the ex-ESMA facility, Buenos Aires. Tribute to the 649 Argentinian soldiers killed in the Malvinas war against the UK in 1982. Jeremy and Santino bonding during a trip to La Boca, Buenos Aires. Colourful houses mark out the barrio of La Boca in Buenos Aires. Argentine heroine ‘Evita’ (Eva Peron) is buried in the Duarte family vault, La Recoleta cemetery, Buenos Aires. Lots of graffiti relating to Argentina’s economic situation can be found in Buenos Aires. One of many declarations that Las Malvinas (The Falklands) belong to Argentina. Hat seller, San Telmo, Buenos Aires. Record shop, San Telmo market, Buenos Aires. Vintage cameras for sale, San Telmo market, Buenos Aires. Antique bottles, San Telmo market, Buenos Aires. Put a few travellers in a room, add a beer, rum or vino to the equation and talk always turn to it. Everyone has had the feeling at some time or another, be it whilst whiling away the days in a hammock on a golden sandy beach, atop a summit in the snow-capped mountains, sitting in a cosy bar in front of a roaring fire or enjoying a perfectly cooked steak in a vine-shaded plaza with a glass of fine – but cheap – red wine. It’s what makes people buy timeshares or run off with the waiter from the Greek taverna they have known for just a week. Colombia even has a bittersweet slogan for its tourist industry – “the only danger is not leaving” – and they are not talking about the alarmingly high incidence of kidnap or political prisoners. We’re not immune to the fantasising – sometimes seriously, other times just for fun. 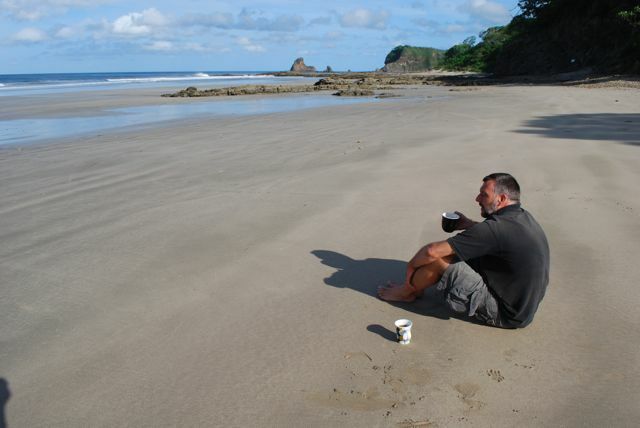 We, like our fellow travellers, are always asking the question – could we really live here? In the 1000-plus days we’ve been on the road there have been contenders – but there’s always a nagging something which makes you think again – the sudden onset of the rainy season, the bureaucracy or simply the local penchant for vallenato or cumbia music at full volume morning, noon and night, all the way through to morning again. 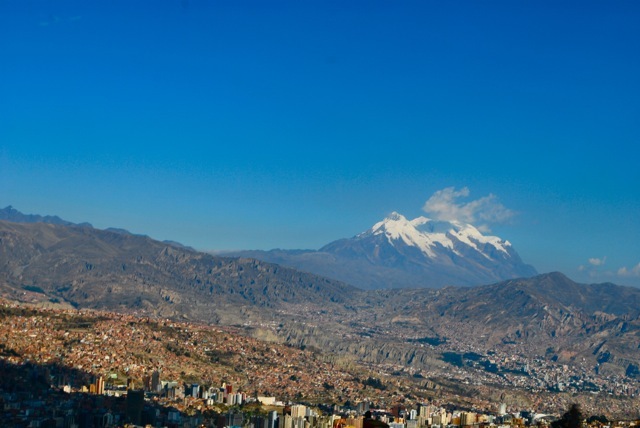 But amongst all the contenders the one that caught us most by surprise is La Paz in Bolivia. On and off, last year and this, we’ve spent almost 6 months living in and around the city. We’ve loved so much of what it has to offer. And that’s the other thing about travellers – put three of them in a room and you’ll have four different opinions. One person’s paradise is another’s nightmare. 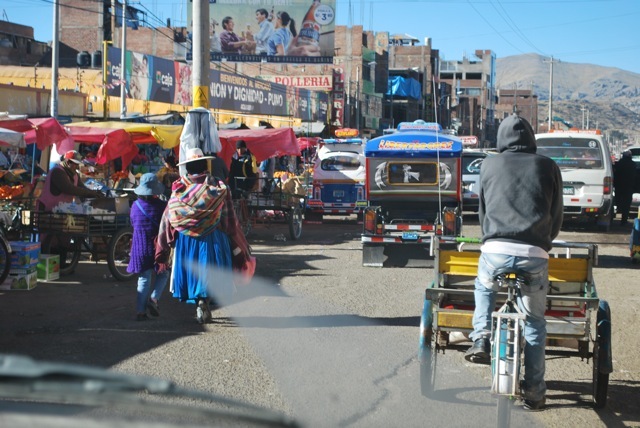 So I know there will be plenty of those people who skipped La Paz entirely or briefly passed through it saying…but, what about the cold, the altitude, the occasional smell of urine on a street corner, the traffic, the slow, slow, slow internet, the, the, the…. We recognise all those things but we see so much more in La Paz. That’s why we went back – again. Buying yet more anticuchos (cow heart skewers), La Paz. Served with potato and spicy peanut sauce, yum! 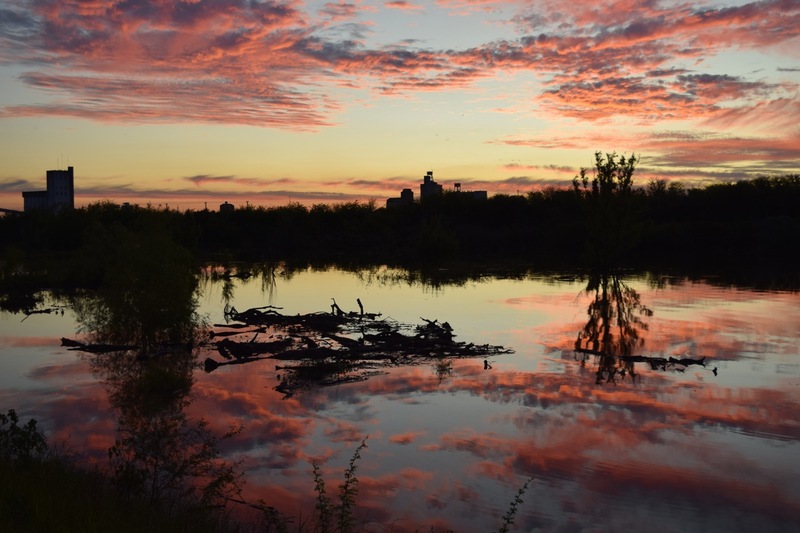 It is a city fiercely proud of its indigenous roots, outwardly brash but ultimately friendly, a city on the rise, that’s set in an unrivaled location. A city whose citizens are alert, active, civic-minded, never letting a politician, corporation or fraudster away with anything – a blockade is a frequent occurrence somewhere around the city. It is a city that likes to eat, dance and celebrate – there is a colourful fiesta for everything. It is a city which gets under your skin and a city in which we made some wonderful, lifelong friends – and that’s rare for those always on the move. In our six months there we tried to sample a bit of (almost) everything on offer – from the chaos of the El Alto market – set in the militant, self-organised, sprawling section of the city perched high on the altiplano overlooking central La Paz – where we picked up boots and a shirt for next to nothing – to Paula’s death-defying mountain-bike jaunt down the world’s most dangerous road, from a night at a local peña (folk music drinking dens) with fellow comrades Tristan and Bianca, to enjoying the crazy day-long dancing spectacle which is Gran Poder – the year’s biggest celebration of Paceña culture and a growing symbol of the inexorable rise of the Aymara influence in the city. Gran Poder, La Paz, Bolivia, June 2014. 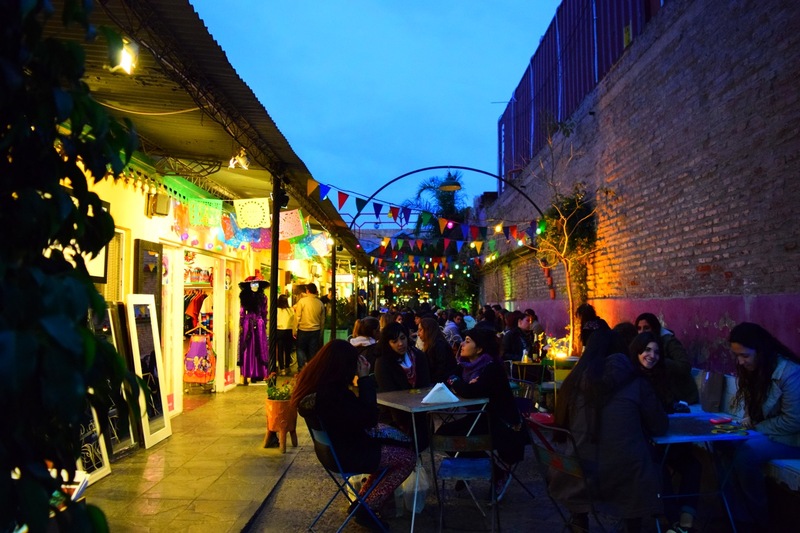 But it was the day-to-day vibe of the city that also grabbed us – socialising, going to football, hiking, shopping, filling up on tasty street food and just chatting to friends. 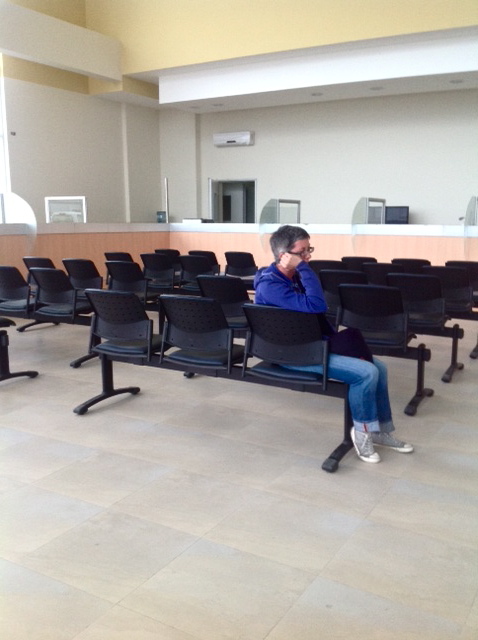 We even rose to the challenge of getting new glasses, medical check ups and doing some paying journalism work. All very normal in a city which is anything but ordinary. 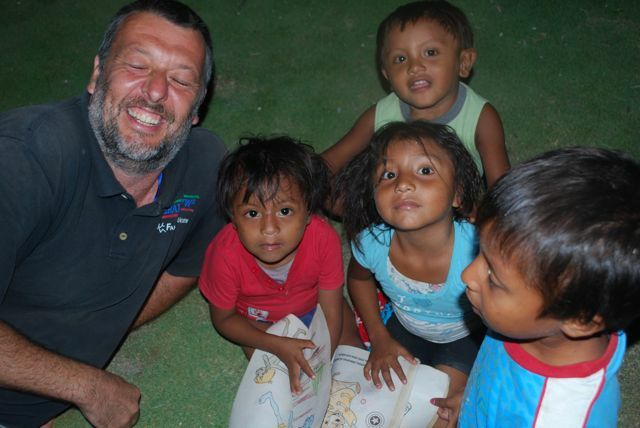 But for us, La Paz will always be associated with our time in Jupapina with Emma, Rolando and their kids David and Bell and the animals. 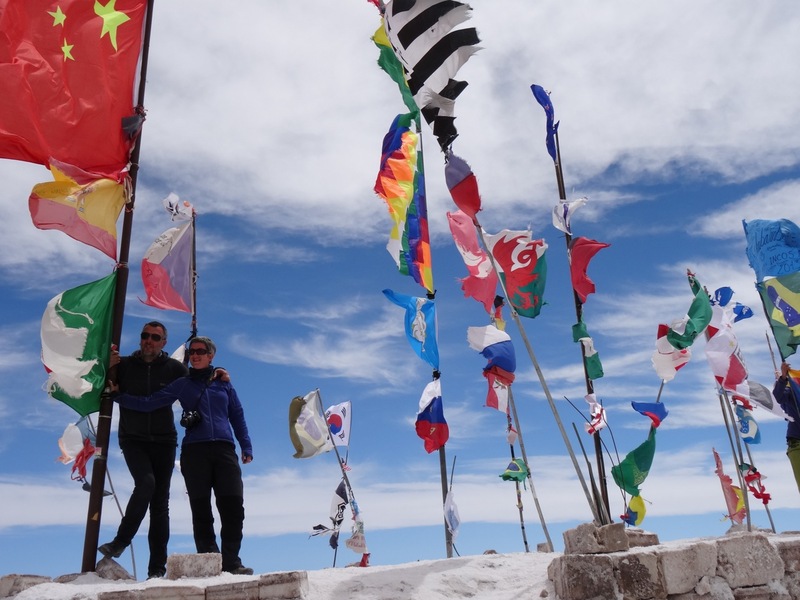 They have been so hospitable, such good friends who offered us advice, did us endless favours and make a mean Chuflay – a Bolivian gin and tonic! 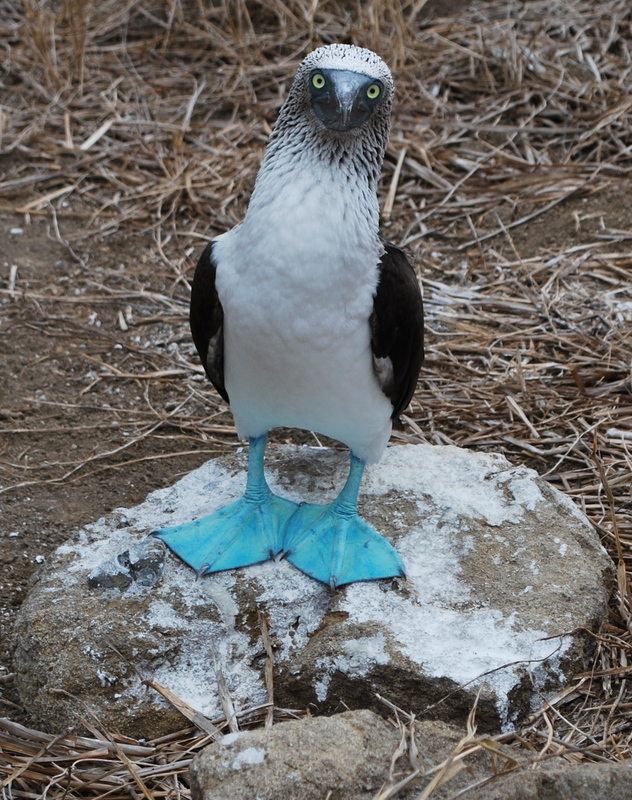 No sooner had we arrived back in La Paz than Rolando said he had a job for us. He was thinking of selling an artesanal local beer in their campsite shop and he wanted us to visit the brewery with him to taste it. Five hours later we crawled home. Jeremy gets a gentle hug from the Mendozas´ dog, named Sir Alex Ferguson. Jeremy, Rolando and Edwin get set for an afternoon of free beer tasting at Saya Brewery, La Paz. Oh dear. To help repay them a little we house-sat for them when they had a rare few days away, worked on the campsite reception and even took their three dogs for a walk. Emma’s parting words when they set off were not to try and walk the three of them at once – take it in turns. Bah! How hard could it be? After a titanic struggle with three of us trying to get the lead on two of the dogs while the third one head-butted the door, angry at being left out, we caved. All three it is then. We were dragged at high speed to the river in the valley below, then hauled through the water while they frolicked in the mud. Ooops. Lesson learned. 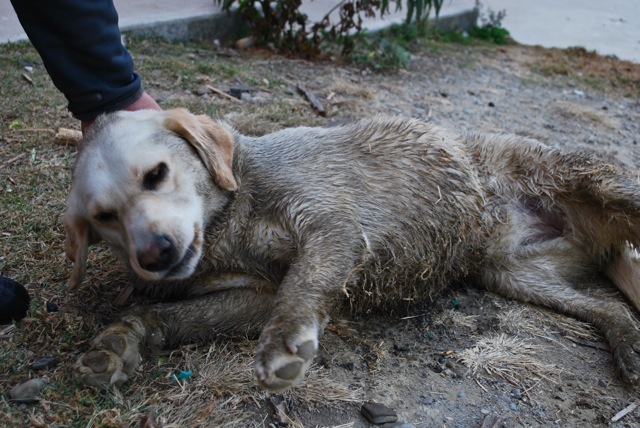 Tilly Bud got a little muddy during our walk. 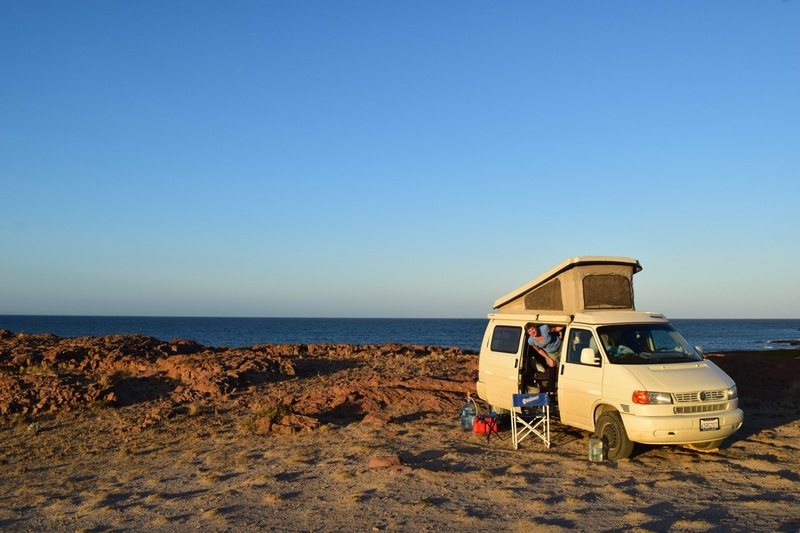 But it wasn’t just the two of us that had a variety of experiences in La Paz – the van, inevitably, did too. 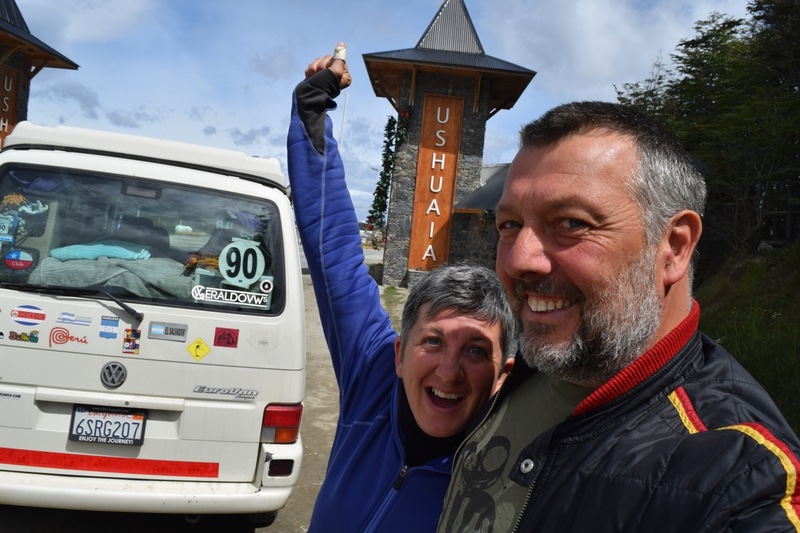 At 4100m above sea level, as we approached the longed-for comfort of Emma and Rolando’s beautiful place in the valley of the flowers – and the amazing campsite we had worked on during our last visit to La Paz – we had our first puncture in 3 years. Also during our stay the van’s electrics went haywire and the battery died. 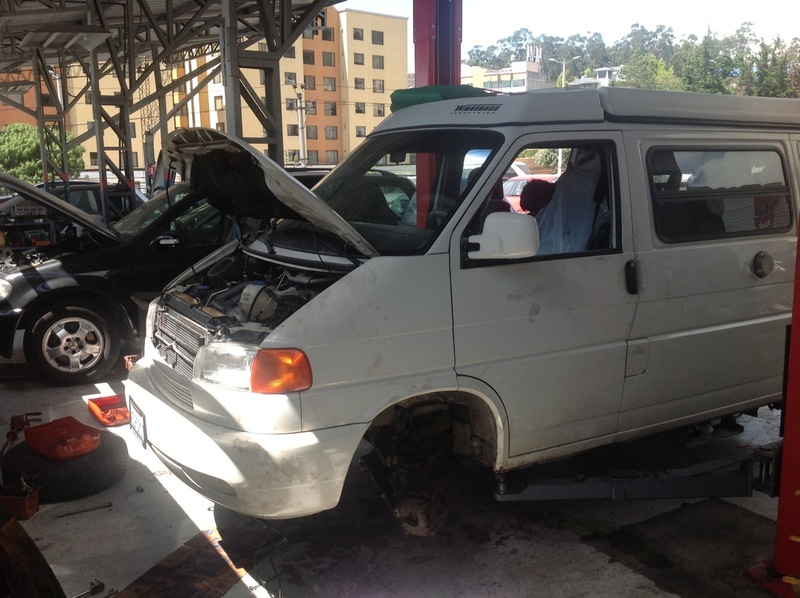 It had always been the plan to get the van checked out thoroughly at Volksmotor, a now famous VW workshop which has become a must-visit for all overlanders. 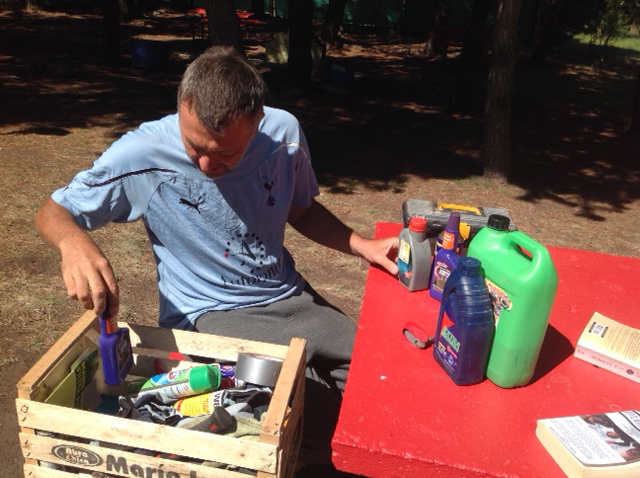 Swiss-trained mechanic Ernesto Hug went over things with a fine toothcomb, presenting us with a (thankfully) minor list of routine things that needed replacing. With me heading back to the UK for a flying visit to see my parents it was the perfect opportunity to get those hard-to-find spares. I was stopped at customs twice on my return to ask what a tie rod end was for, or why I had brake caliper seal kits in my hand luggage – oh, and did I really need that much sandwich pickle, thai curry paste and tea bags? The answer, of course, was yes. The friendships we made in La Paz have travelled with us. During some of the many, many barbeques we had at Emma and Rolando’s, we met the parents of another friend of ours, Anahi. 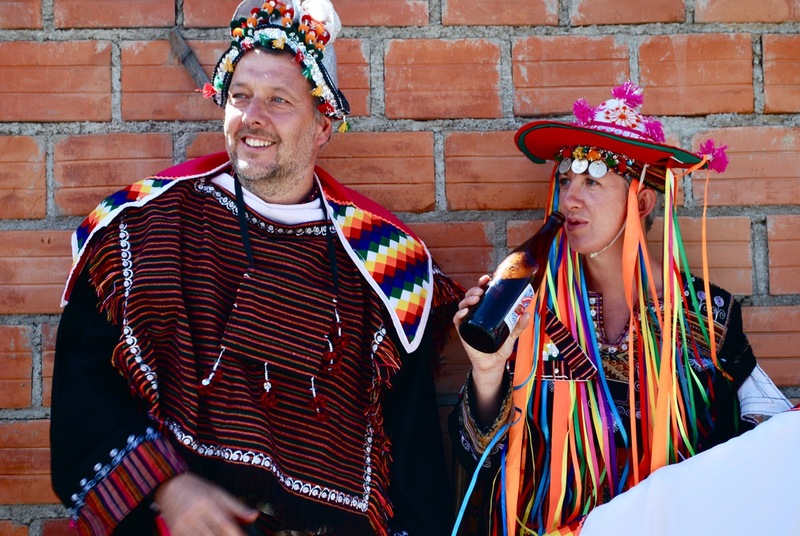 Luis and Ellie live in Cochabamba – smack bang in the heart of the country’s richest agricultural region – and kindly extended an invitation to show us the gastronomic delights of the city, whose inhabitants claim they ‘don’t eat to live but live to eat’. They aren’t wrong. 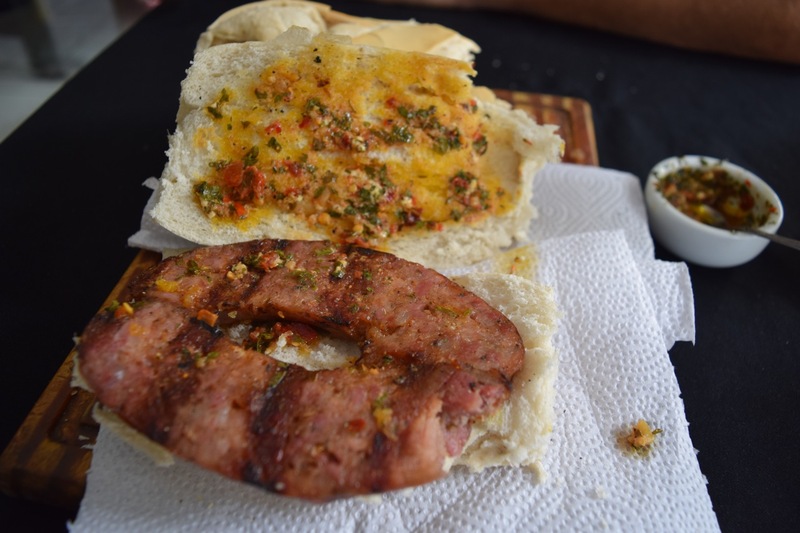 No sooner had we, with some difficulty, parked our 17ft van in their 17ft-long garage than we were sat in a shady courtyard enjoying plates of boiled and fried guinea pig, dried strips of beef charque, stuffed locoto peppers, mote with cheese, roasted duckling and a couple of local beers. Serving up just a little portion of chicharron (fried pork) in Cochabamba, Bolivia. Cristo de la Concordia, Cochabamba´s own ´Christ the Redeemer´, with Anahi´s parents and sister. 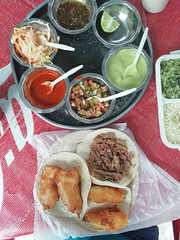 Next day, after a couple of mid-morning snacks at the local market, we tried what we were told was the best chicharron – fried pork – in the world. It’s a lofty claim but having tasted the most succulent pork ever, we really cannot argue. 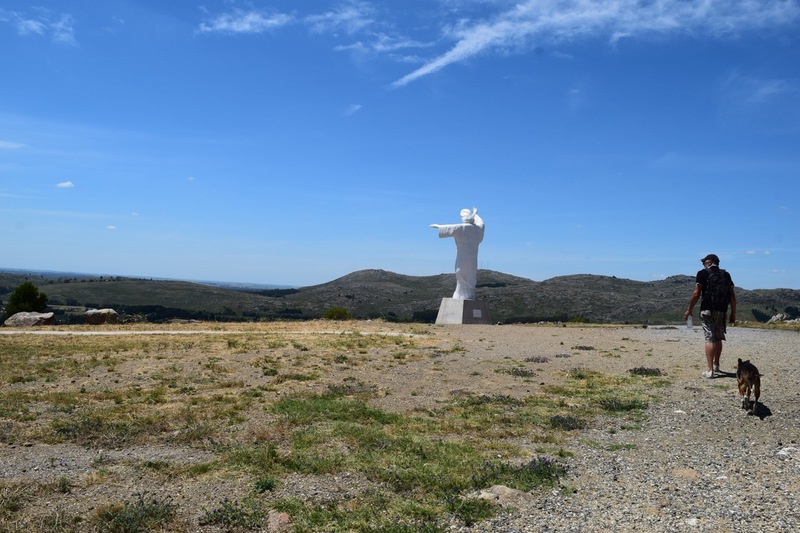 A walk up to Cochabamba’s ‘Christ the Redeemer statue’ – well, actually, we drove almost all of the way – hardly made a dent in the weight we put on in just a long weekend with such generous hosts. When we left La Paz last year we left some bags of clothes and other things behind, knowing it gave us the ideal excuse for coming back. This time we just (accidentally) left our beloved lime squeezer – I’m not sure that alone would be enough to bring us back, but everything else La Paz has to offer may well do the job one day. Things we now know to be true: Nowhere´s perfect. Bye bye to Emma, Rolando, David and Bell. Sniff! 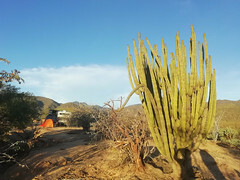 Colibri Camping, Jupapina, south of La Paz. Our workplace and home for nearly six months.